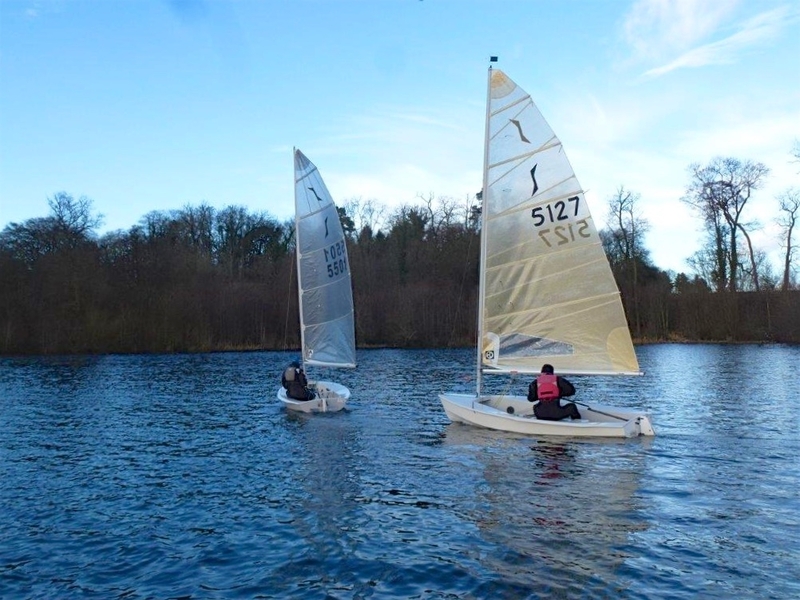 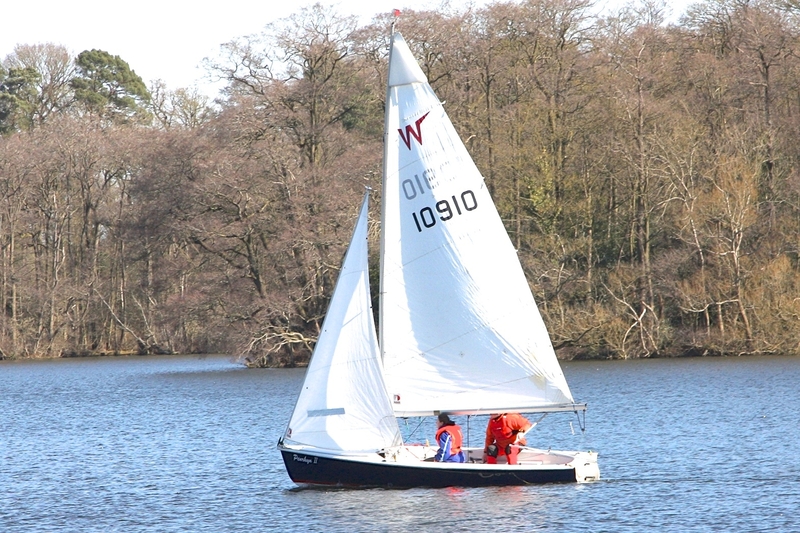 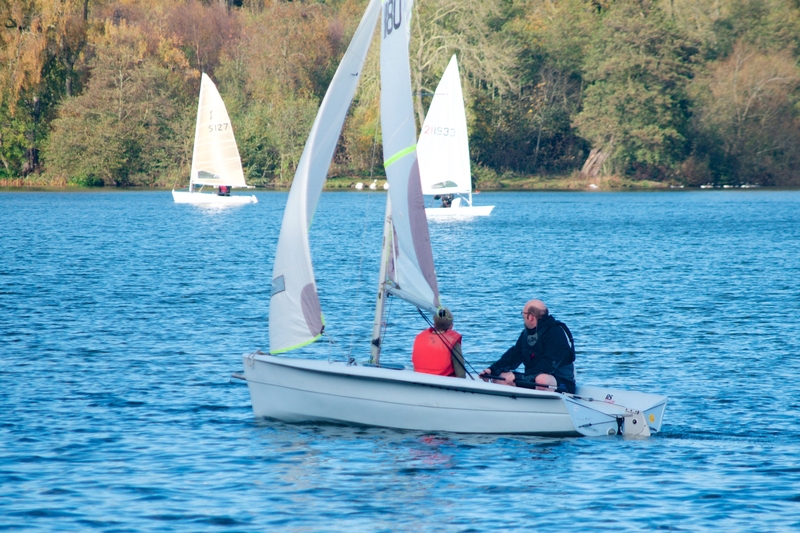 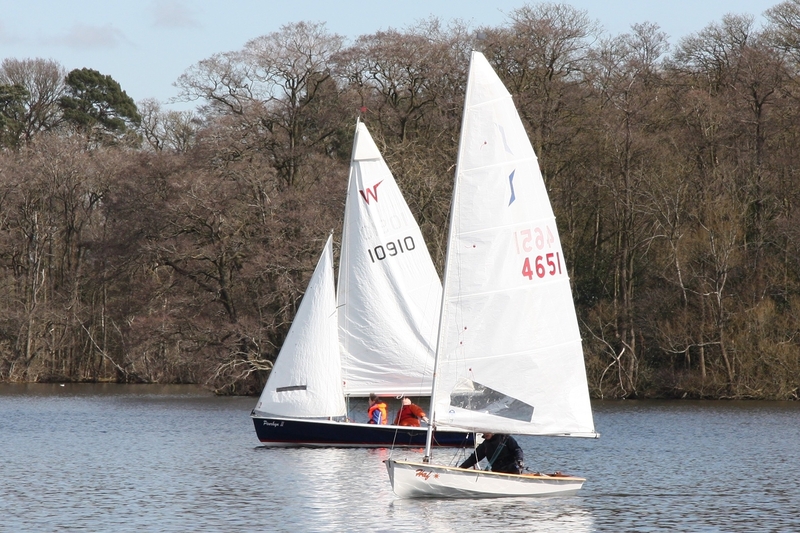 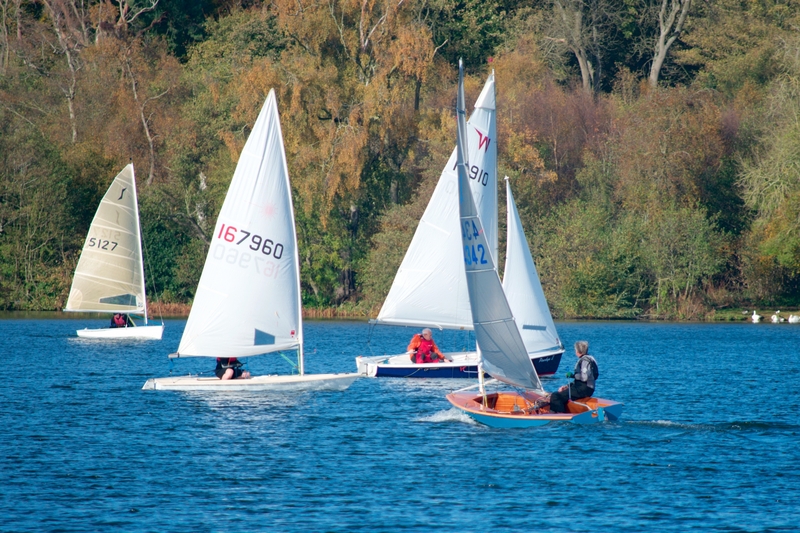 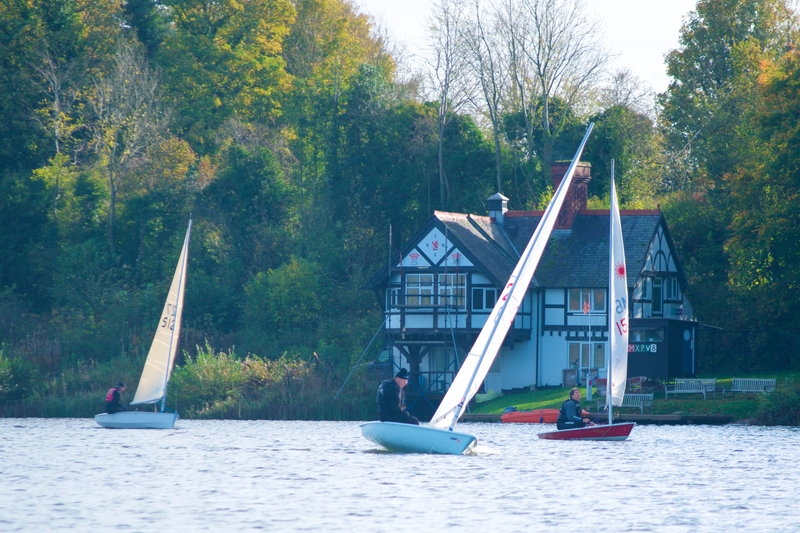 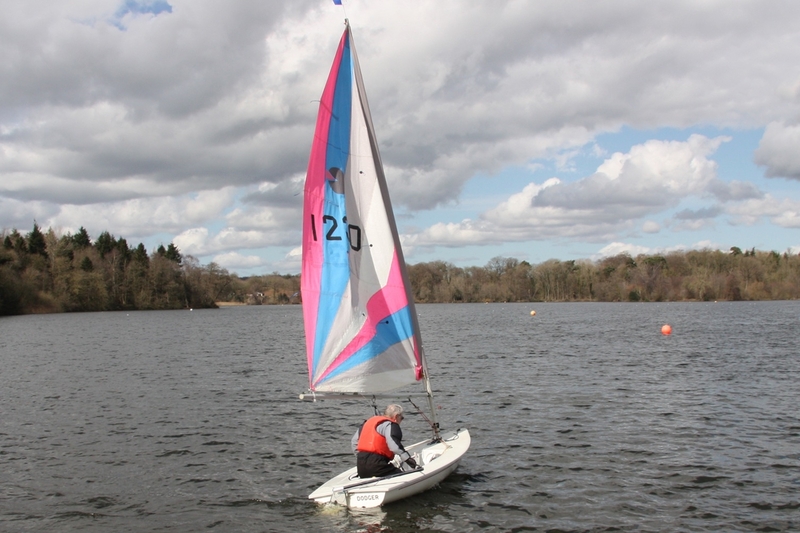 If you wondered if you should have come to Colemere today, this photo of Nick Blore introducing new member Steve Dakin to the Wayfarer may help. 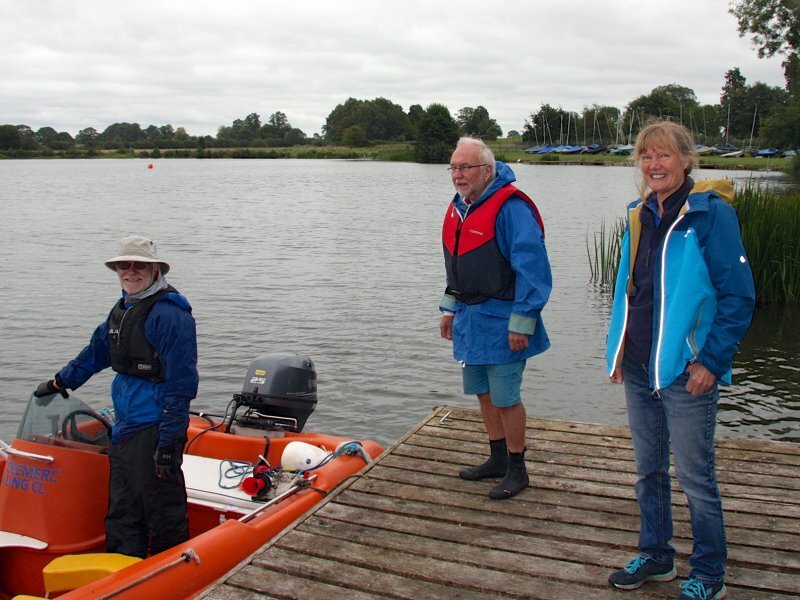 It was nice to see old members, the Smith family, who sailed in the late 1960’s, and came to visit and enjoy a picnic at the clubhouse today. 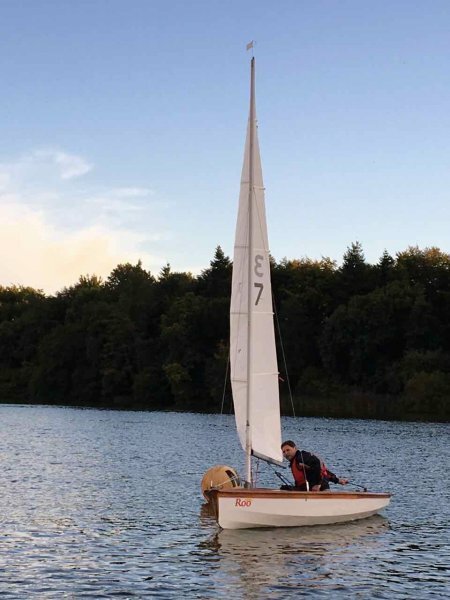 Slightly late for our first sail of the season and Rigging Party this year. 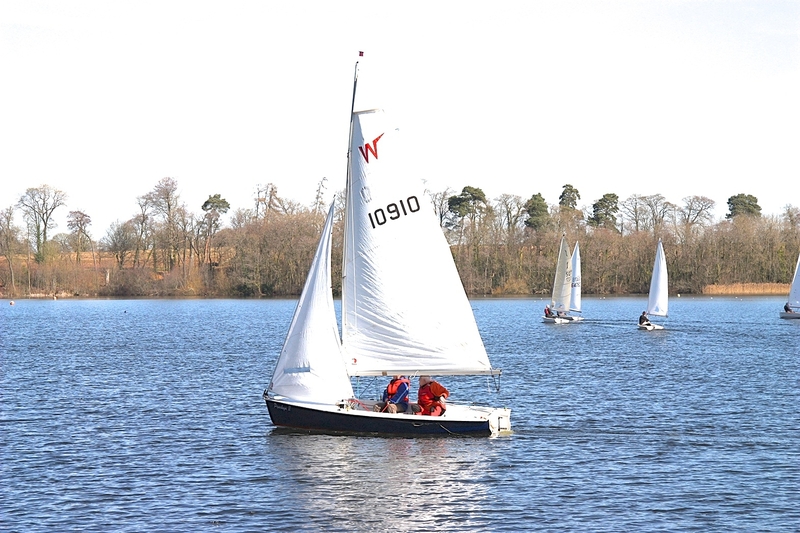 All down to the adverse weather on Sunday 18th March which was the date it all planned to happen. 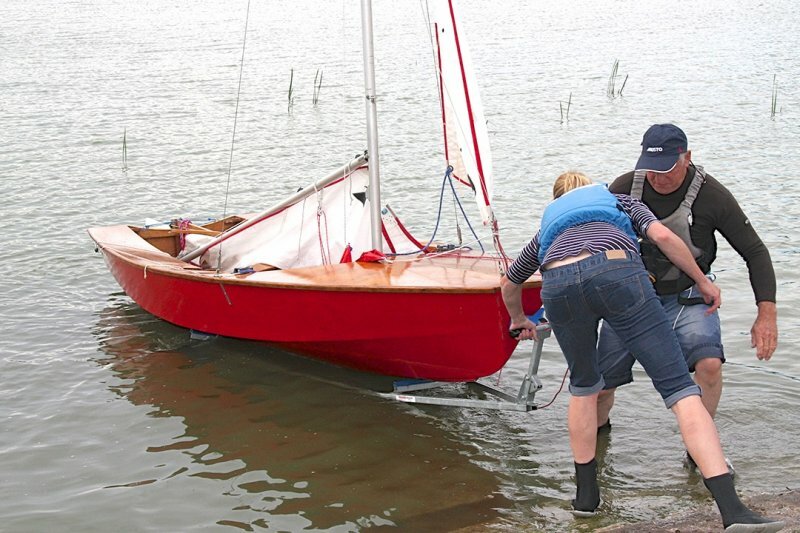 We had to postpone. 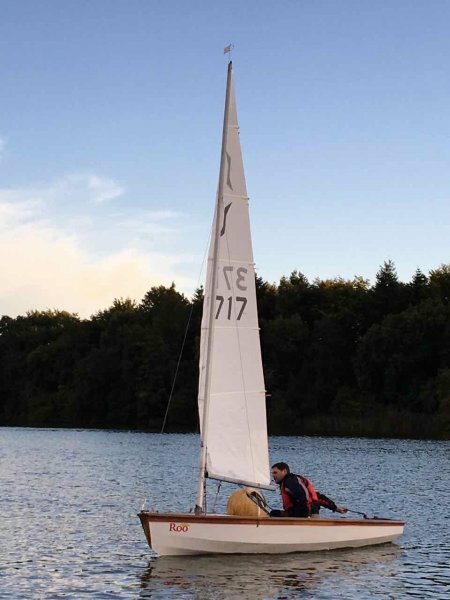 It was worth waiting for. 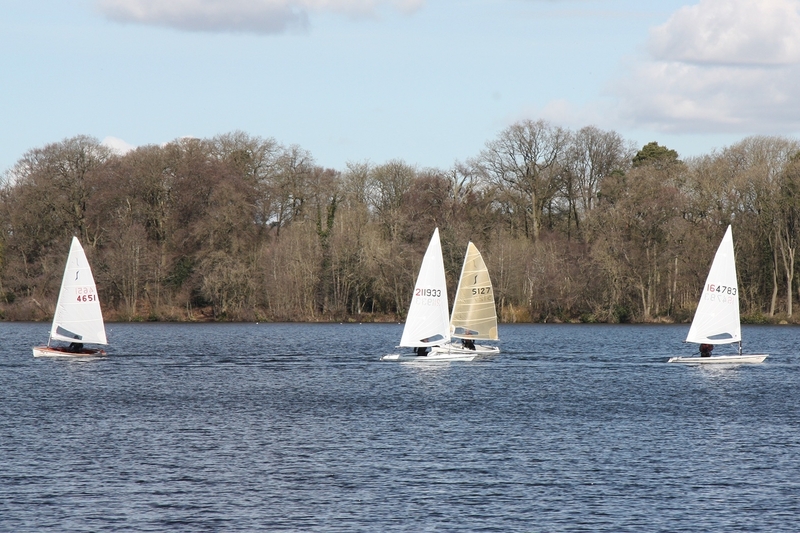 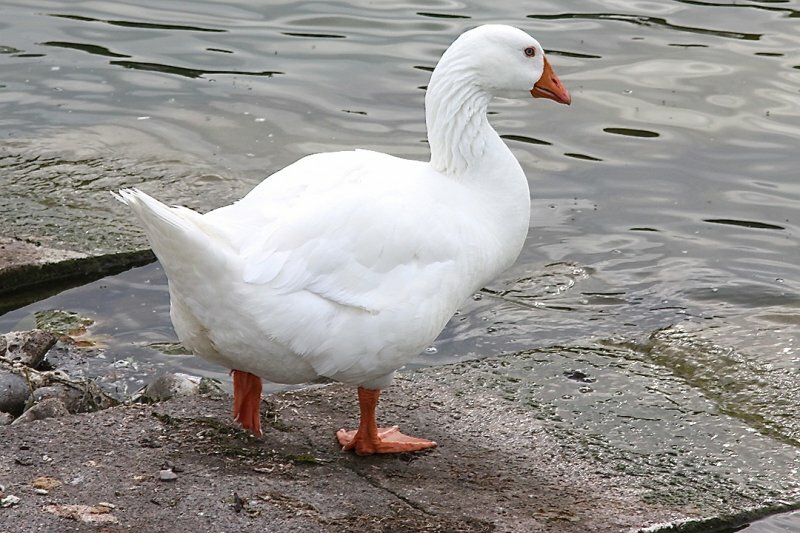 A nice sunny day, not too cold and a gentle breeze on the lake. 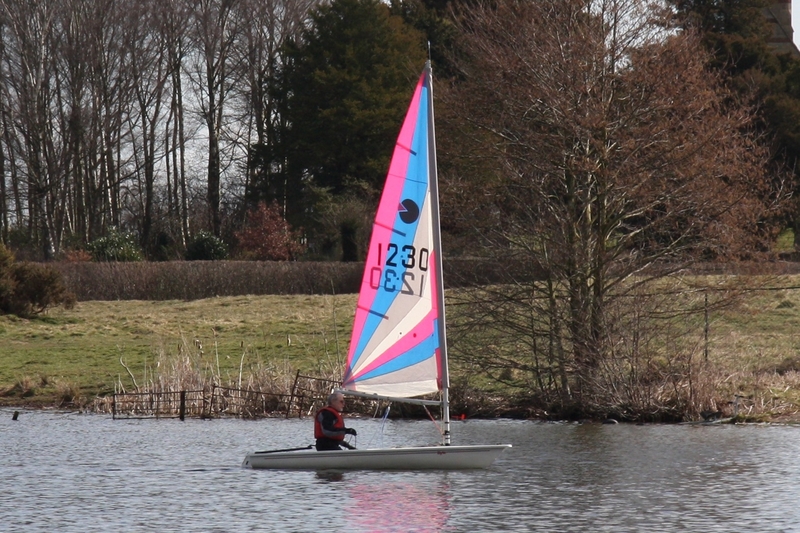 At least 12 of us took to the water for this first outing of the season. 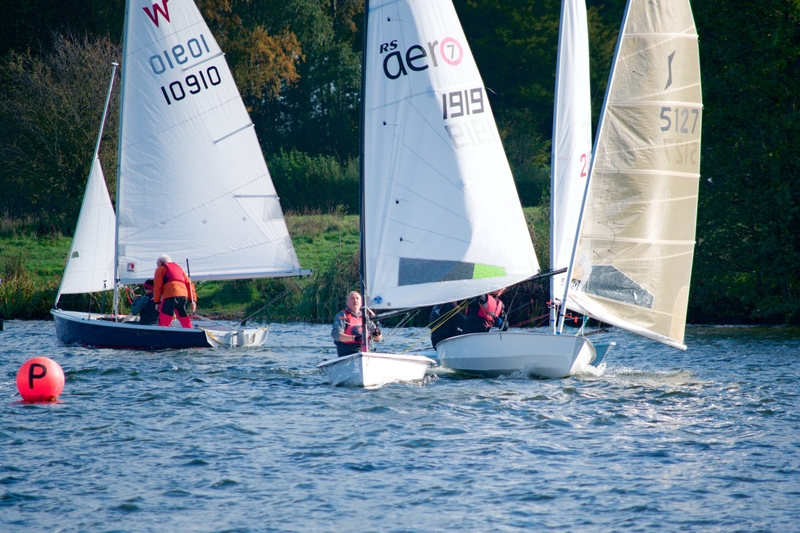 A sociable lunch (bring and share style) was a welcome intermission between the two races. 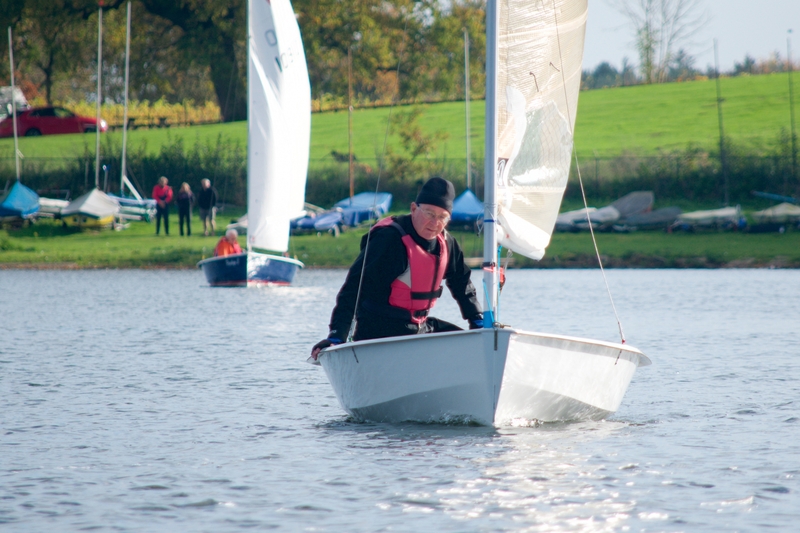 On the menu, courtesy of the membership, was soup, bread, quiche, sausage rolls and pork pies amongst other delicacies. 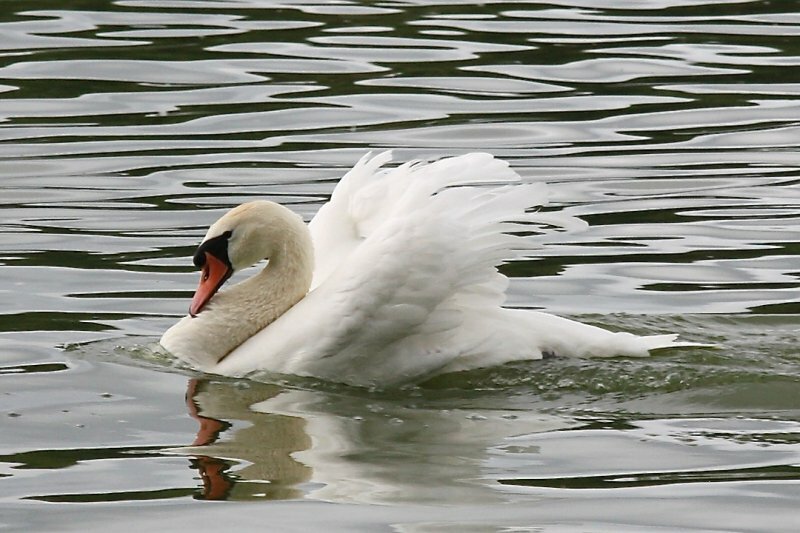 I think there was still a table of food to feed five thousand (well nearly) when we’d finished. 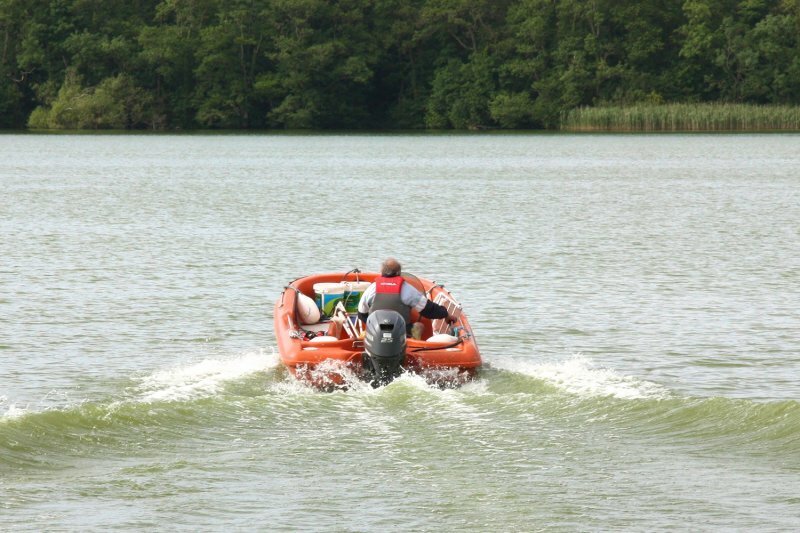 Thanks to Pete, Ellen and Tim for setting and running the races, and keeping us safe. 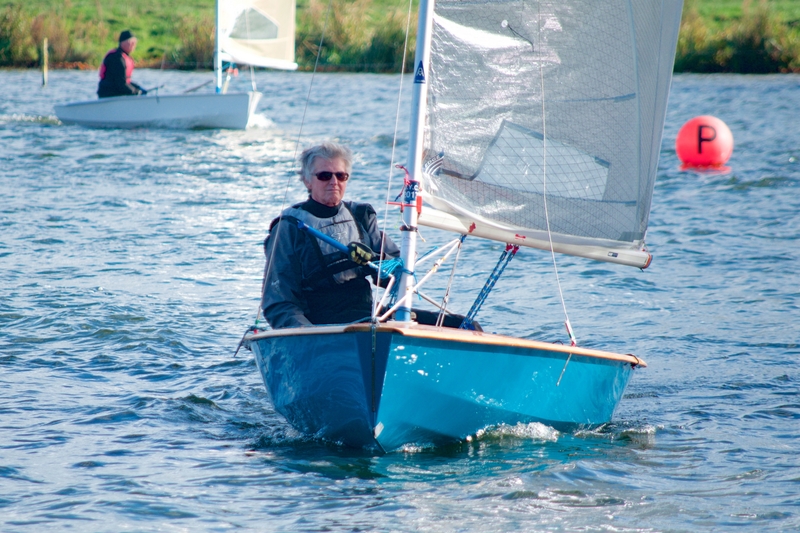 Graham Edwards took some pictures of the sailing below. 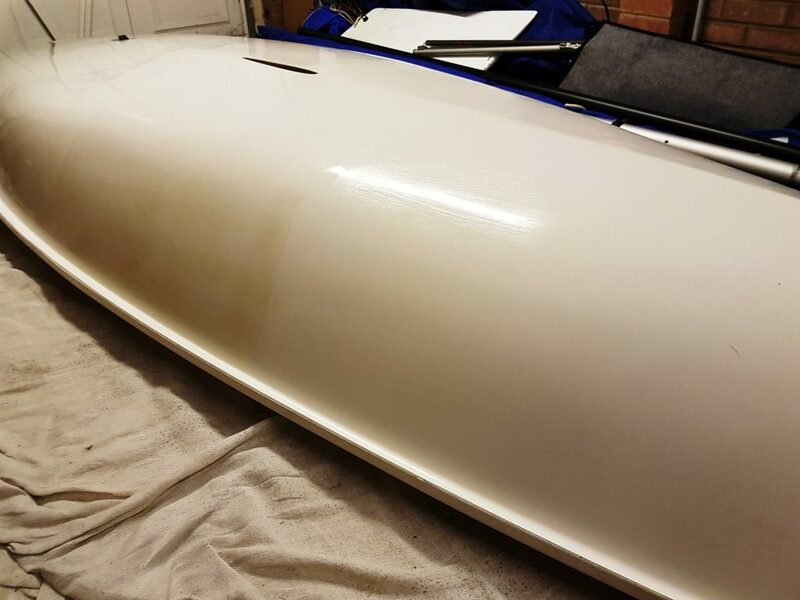 Thought this may make a (semi) interesting blog post during the close season. 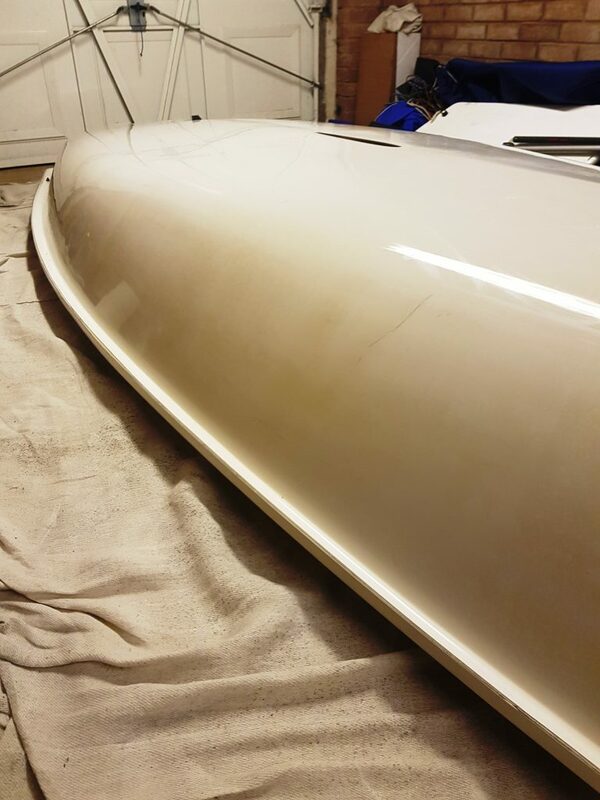 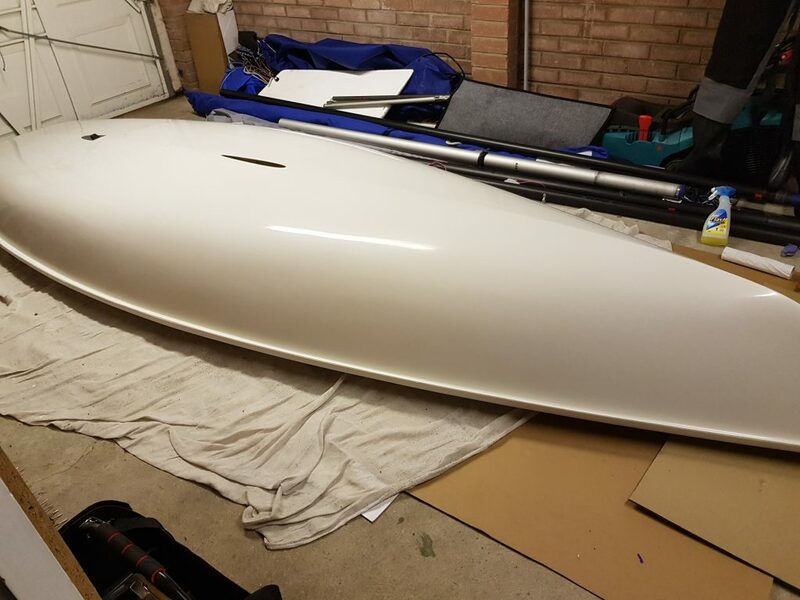 Got my boat at home at the moment and after hard polishing I still couldn’t get the yellowy brown colour out of my hull that a few of us are suffering from. 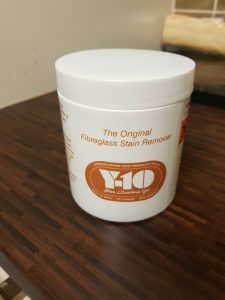 Upon Googling I discovered Y10 which is a slight acid which chemically reacts with the stain and comes up perfect almost instantly. The results are plain to see and highly recommended! 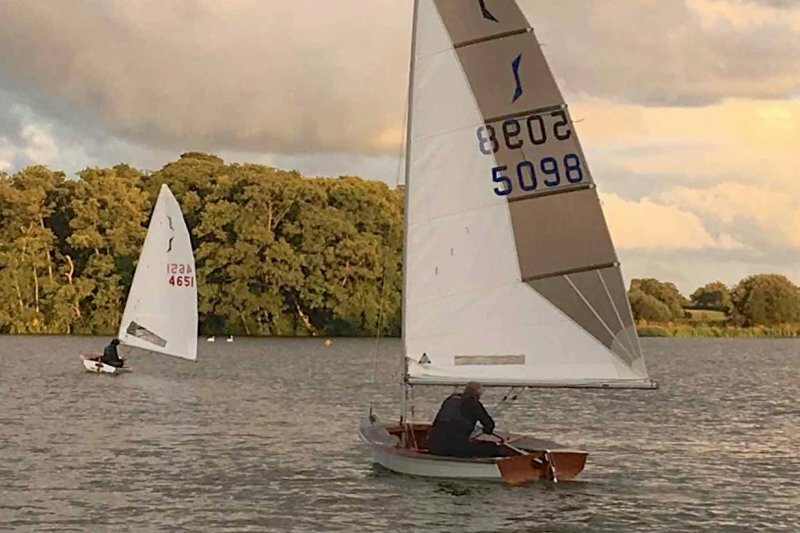 Here is a short video and some pictures, which I think were taken by Tim or daughter Maddie from the safety boat (at the end of last season). 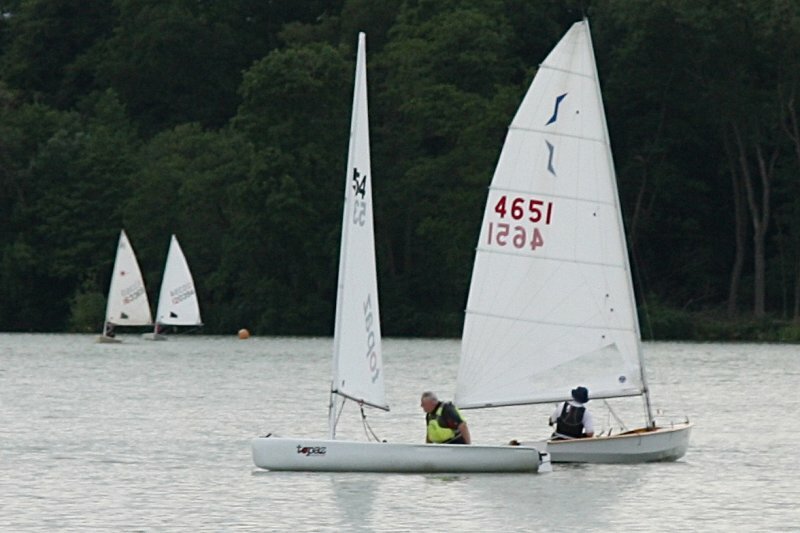 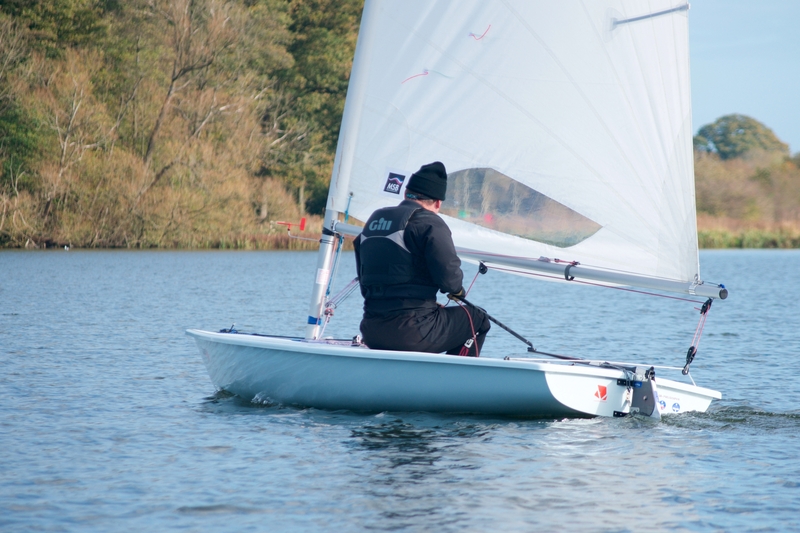 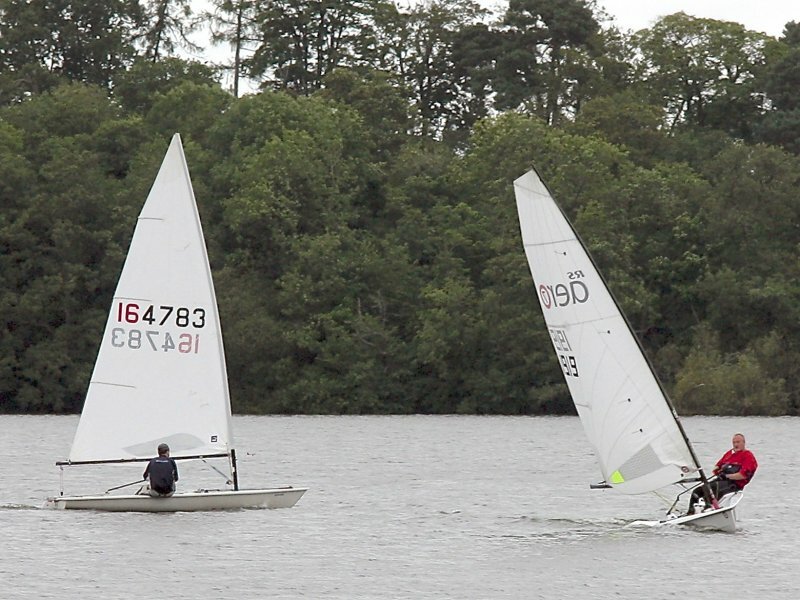 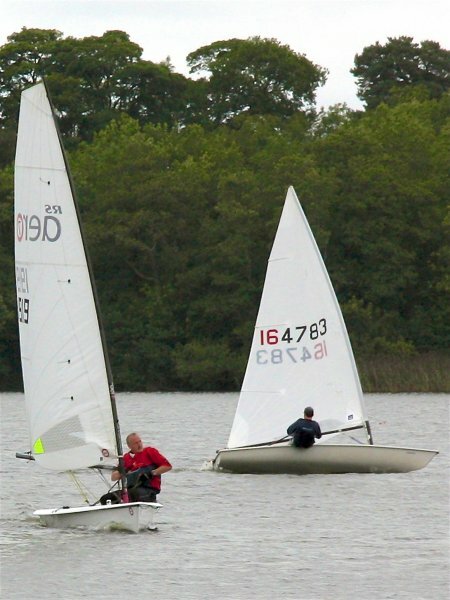 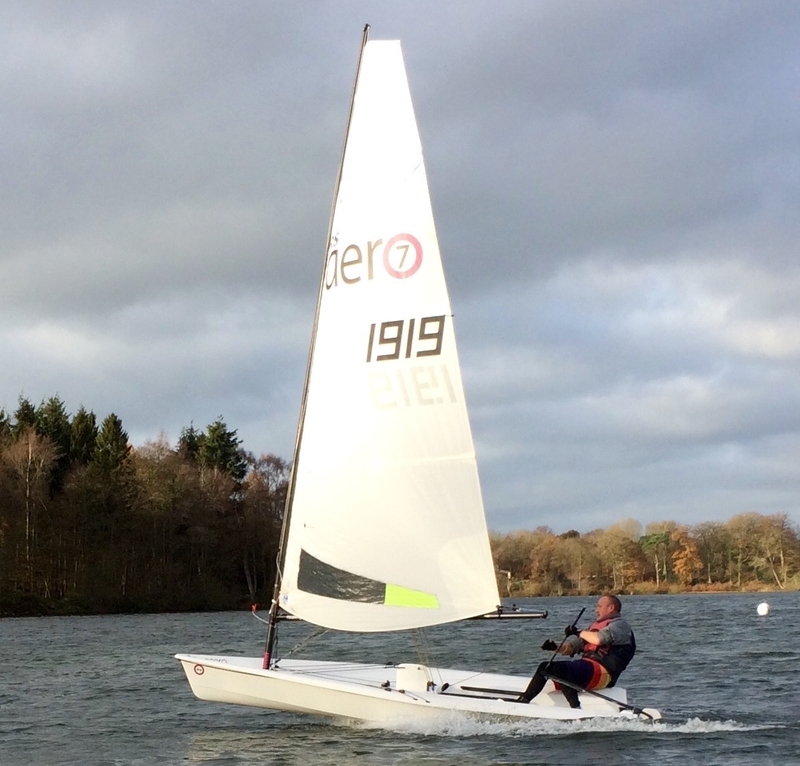 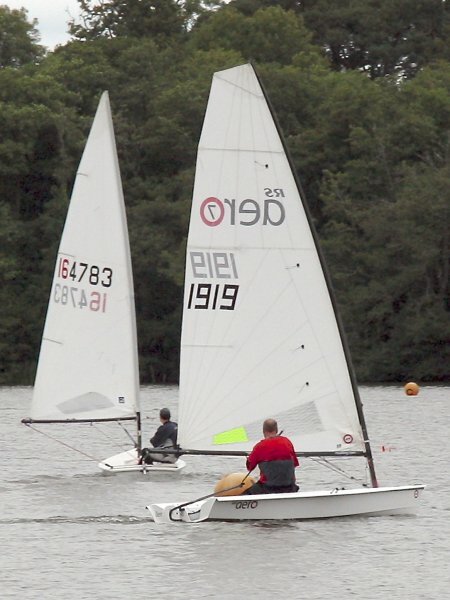 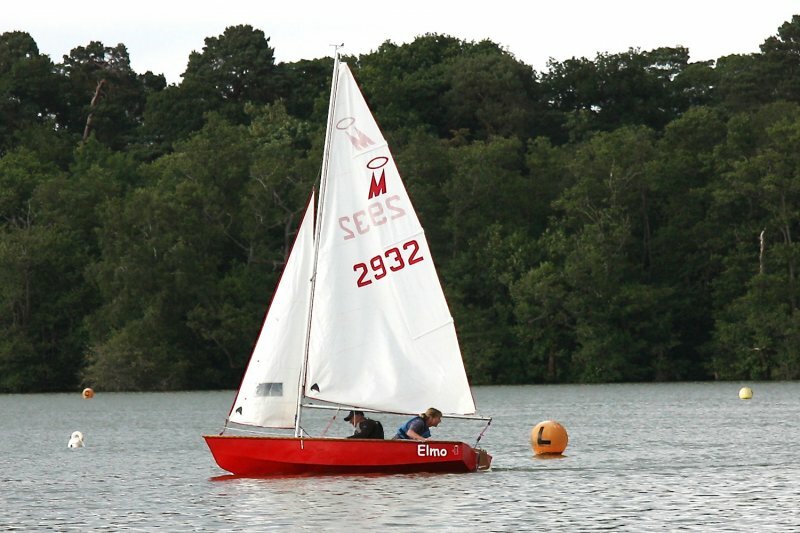 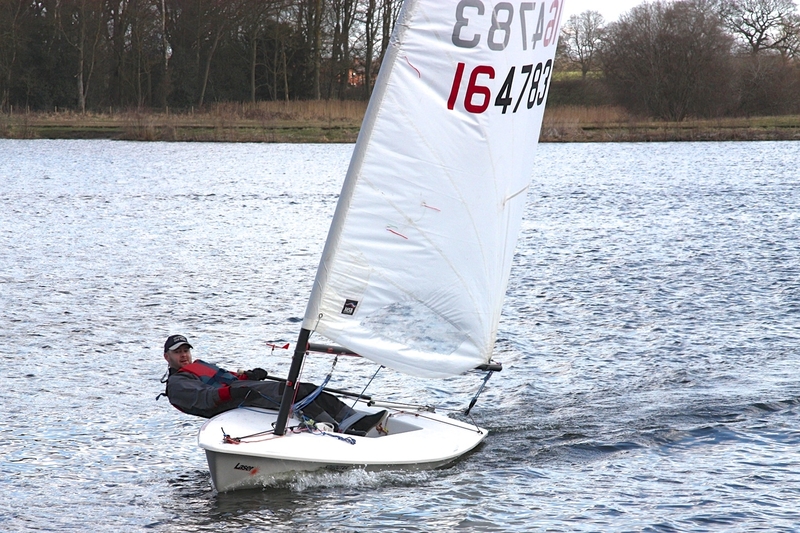 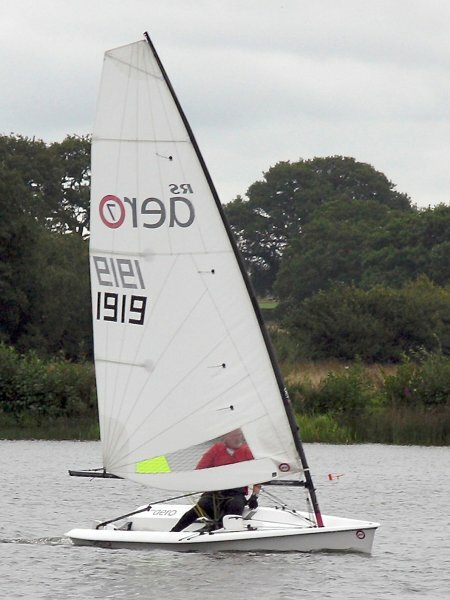 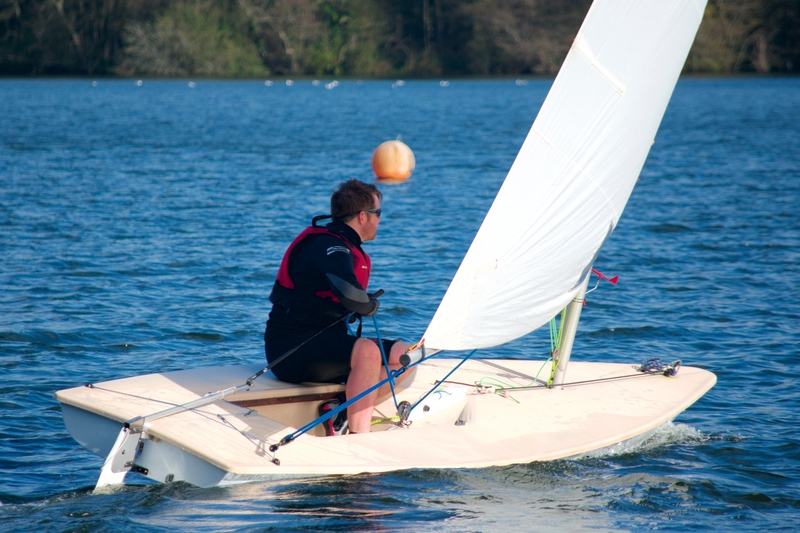 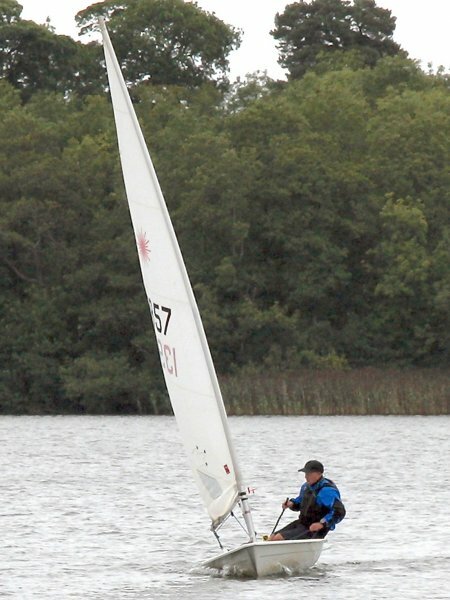 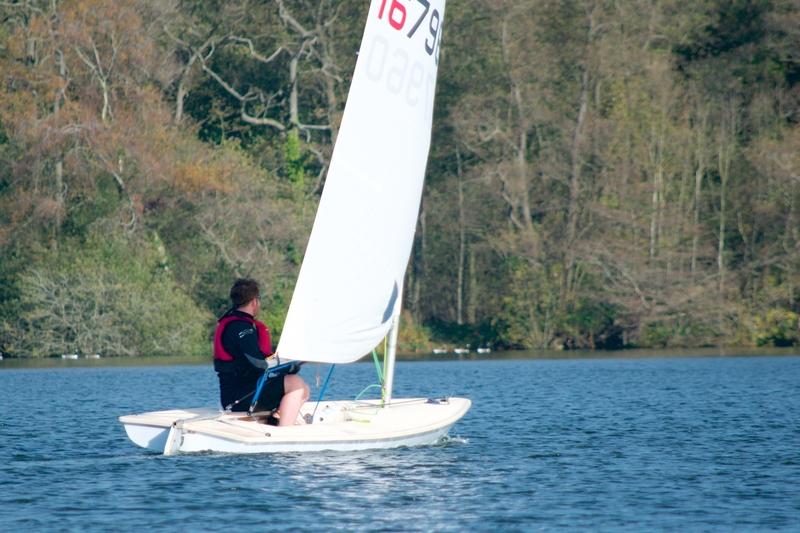 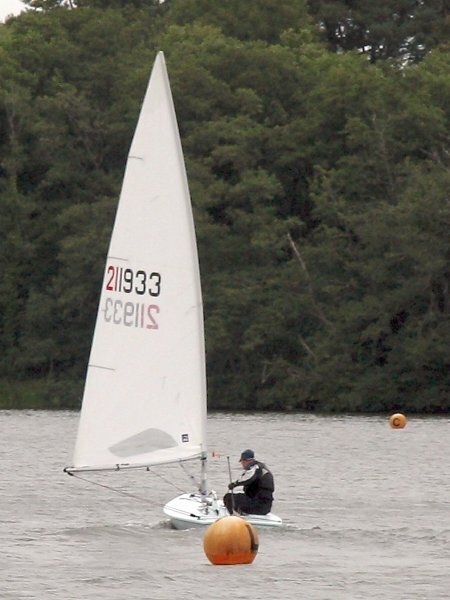 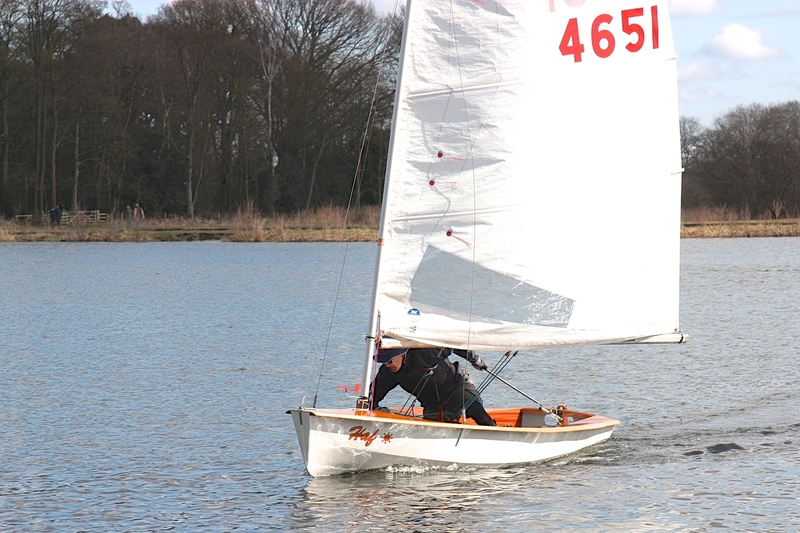 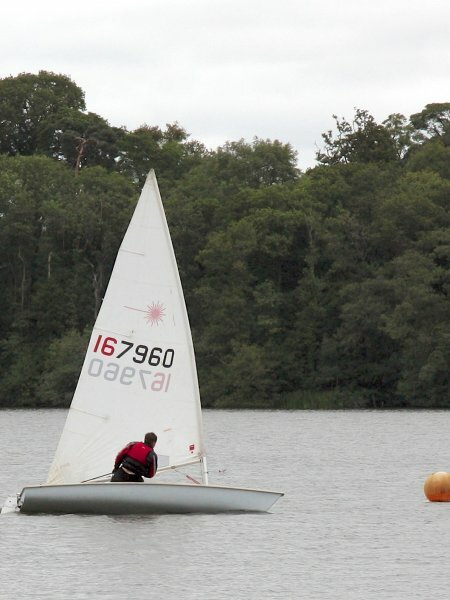 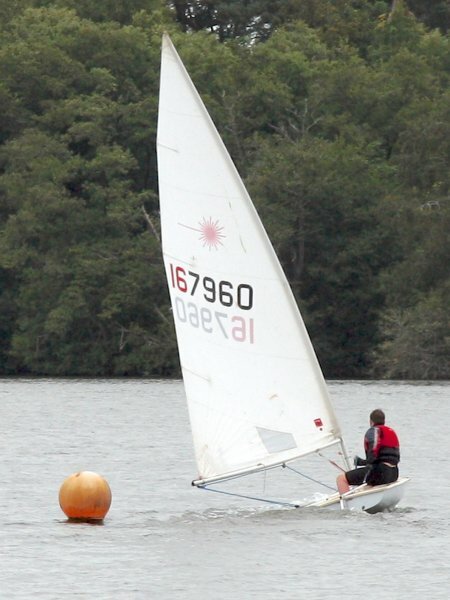 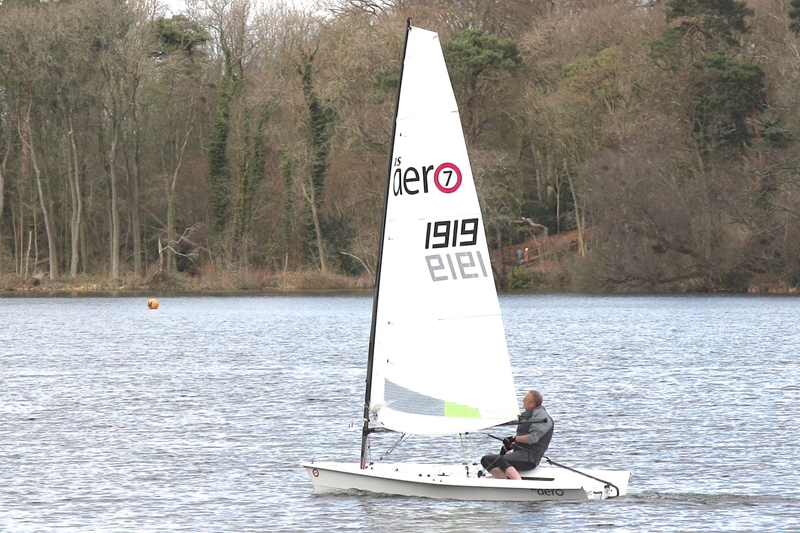 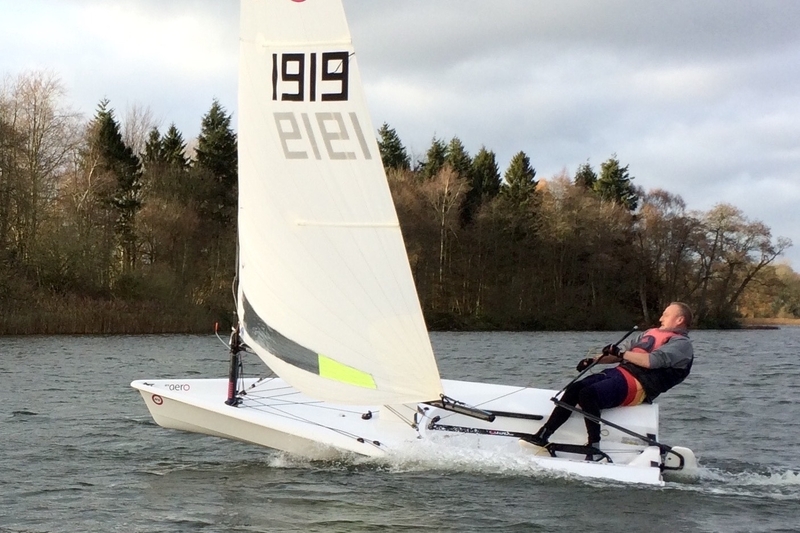 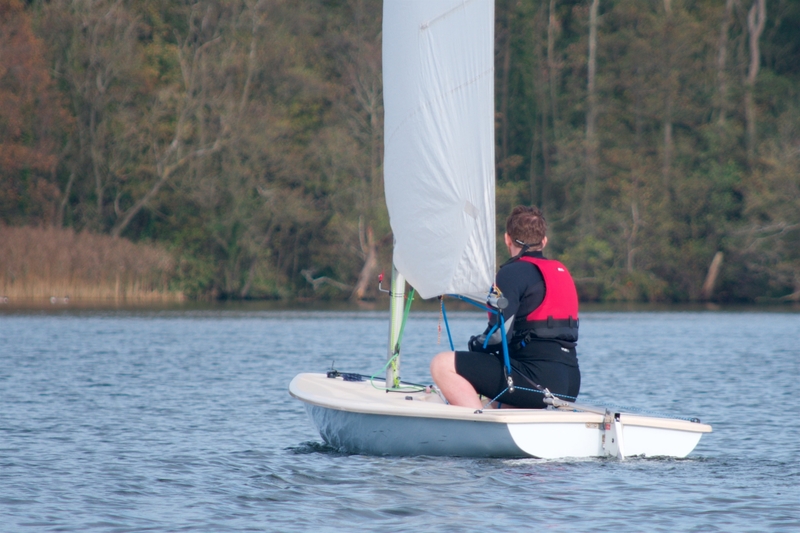 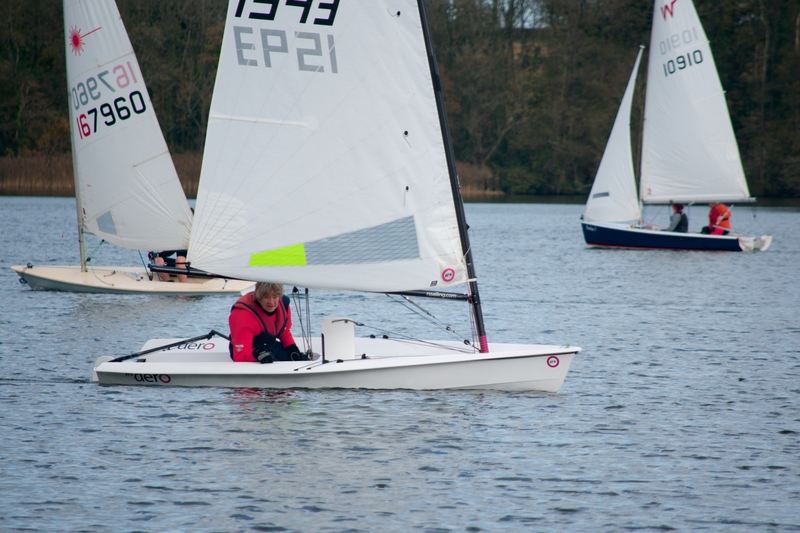 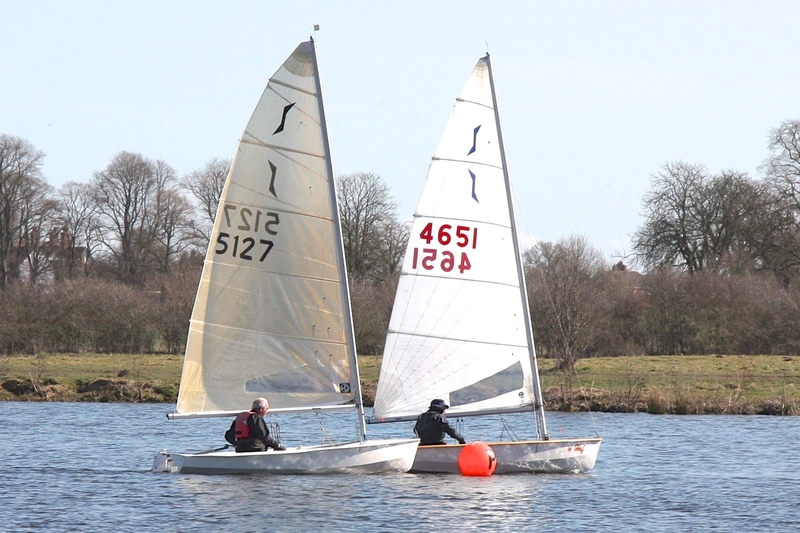 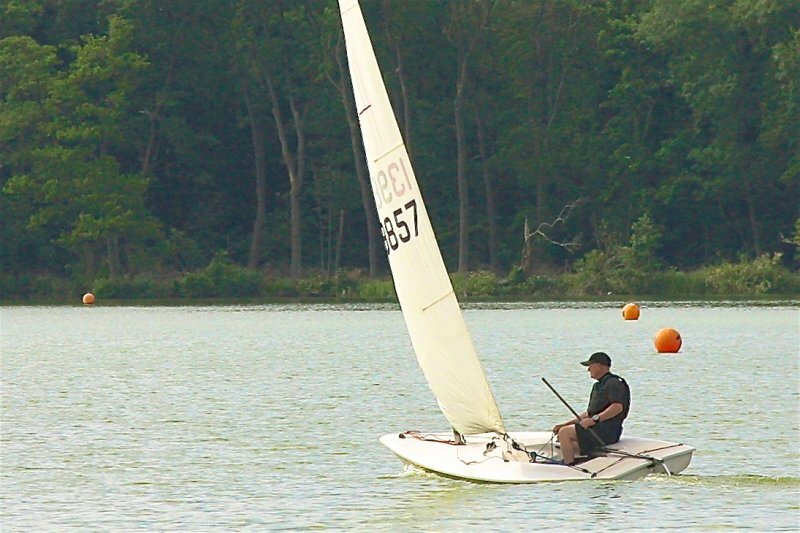 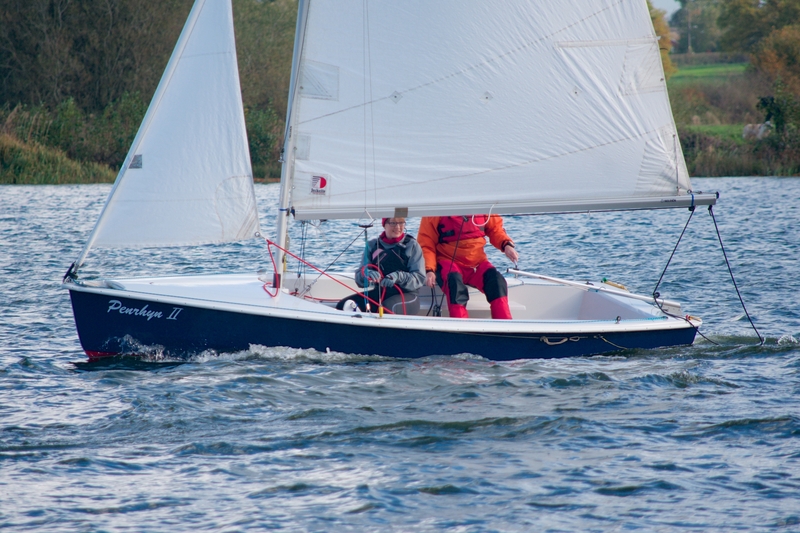 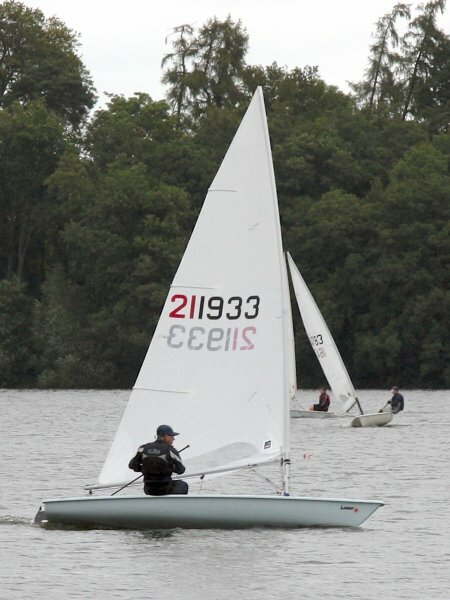 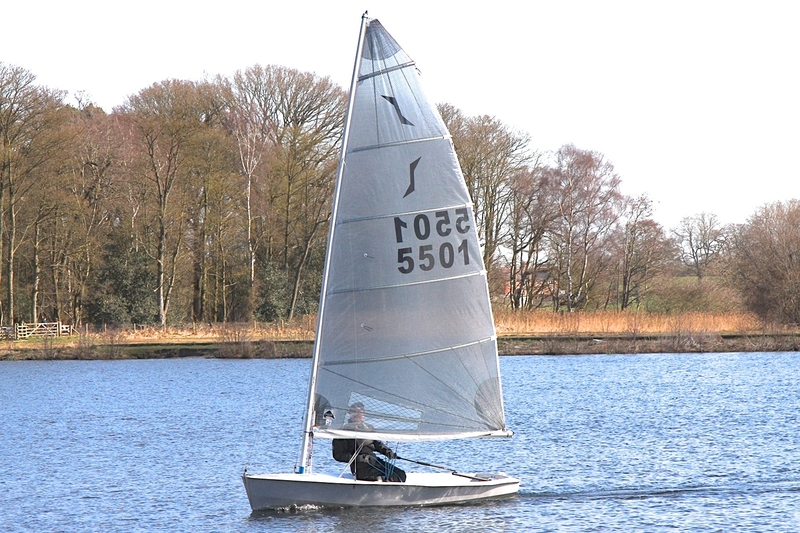 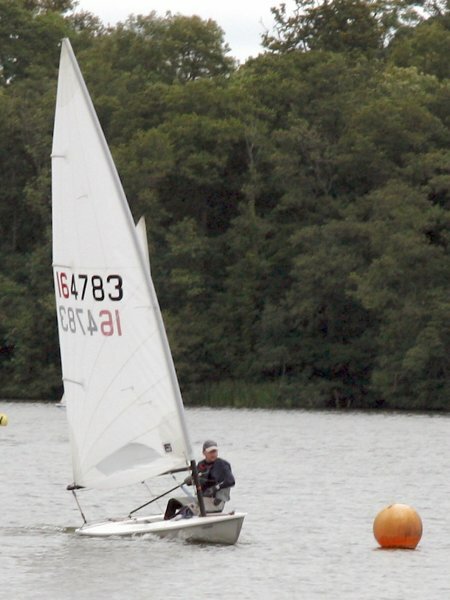 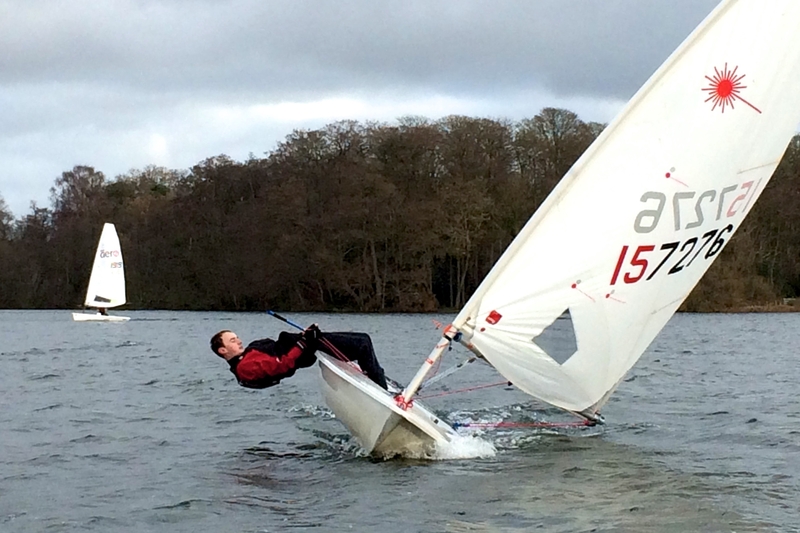 Martin in his Aero and son, Ryan, in the Laser. 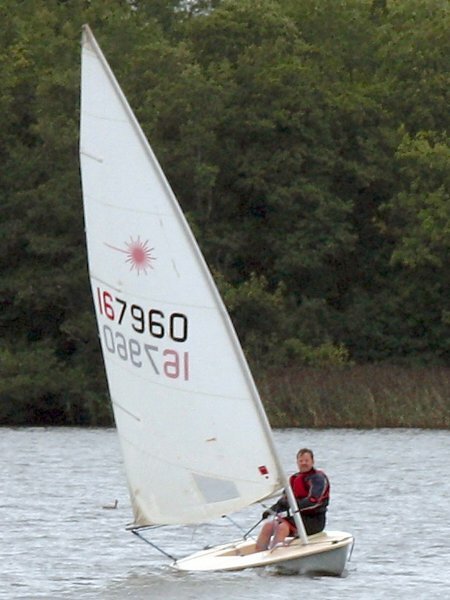 The video shows Martin in the Aero, with a glimpse of Tom in a Laser. 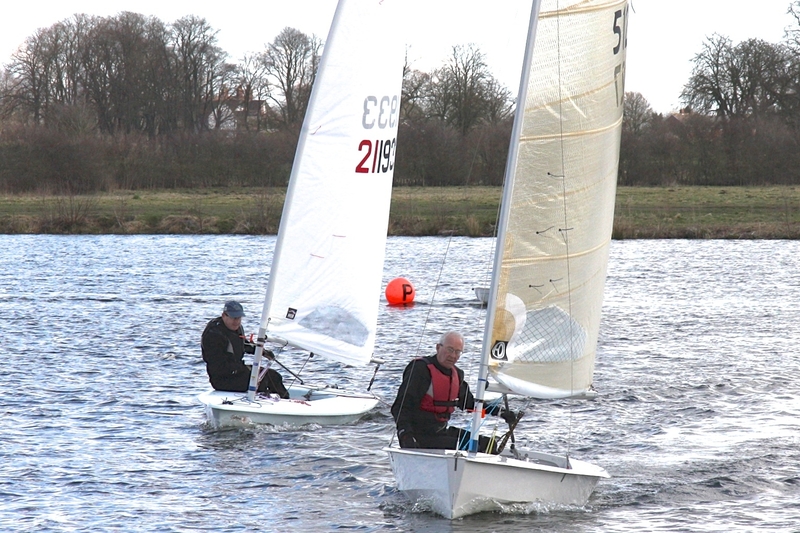 Boxing Day was a light wind day, which given the air and water temperature was, perhaps, a good thing.Ten mildly masochistic crews took to the water, nobody gave the rescue boat anything to do, and, after about 45 minutes, the ex-Commodore decided that it was possible to have too much of a good thing (a decision that several of the sailors supported enthusiastically in the post-match analysis). 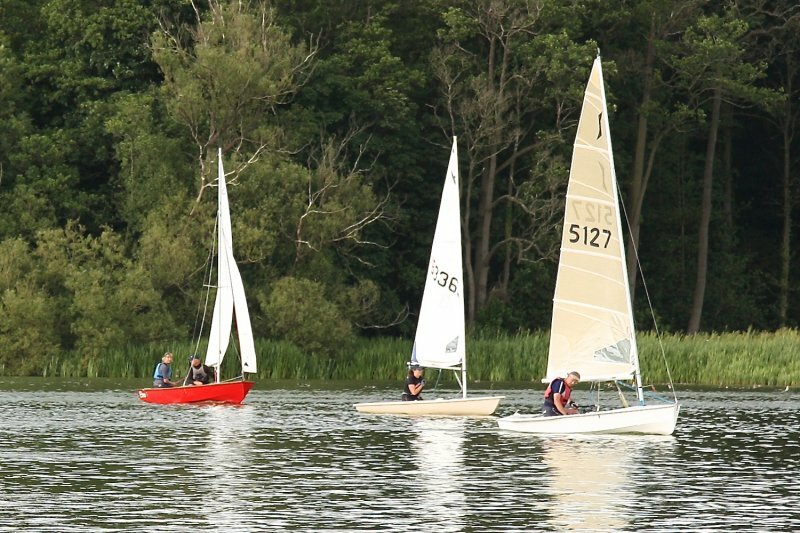 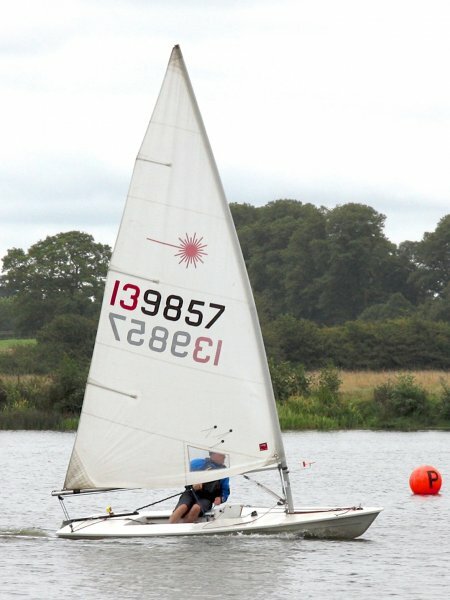 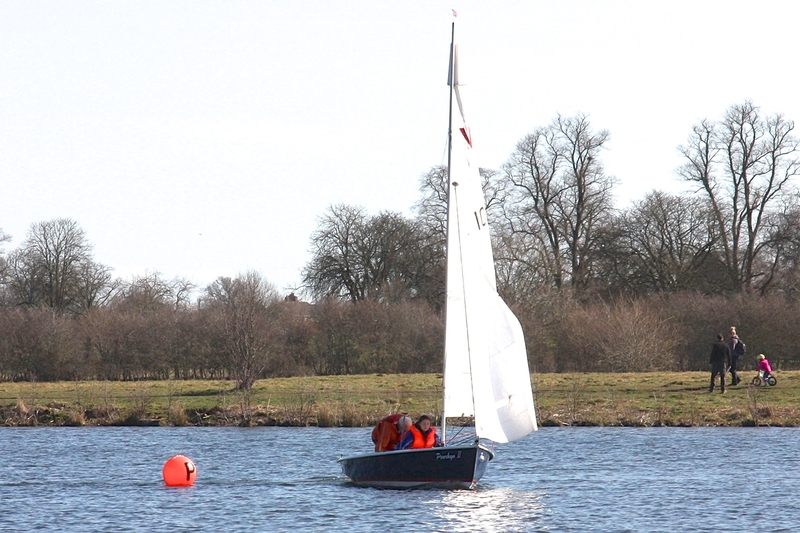 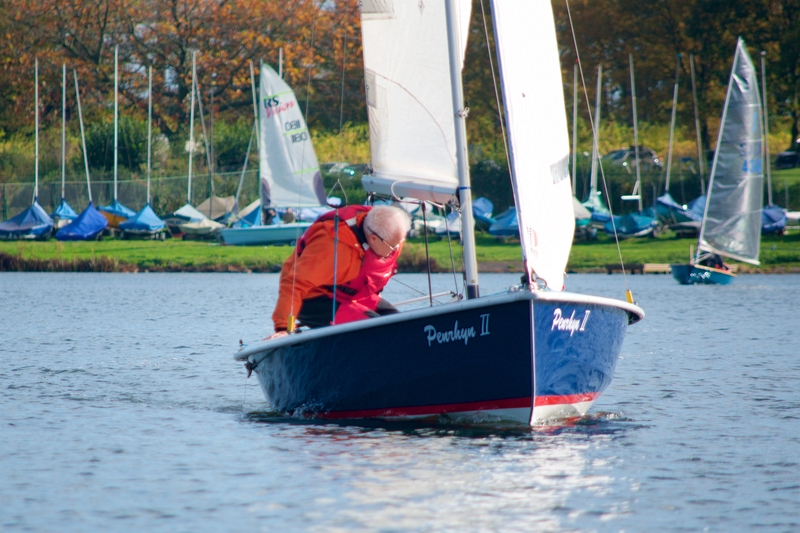 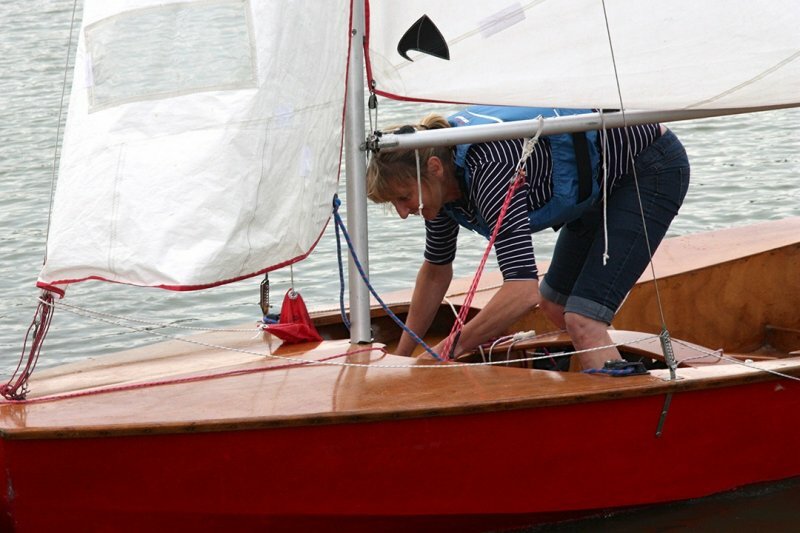 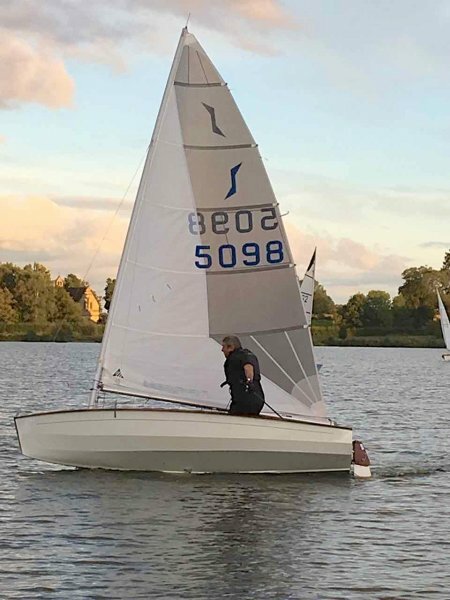 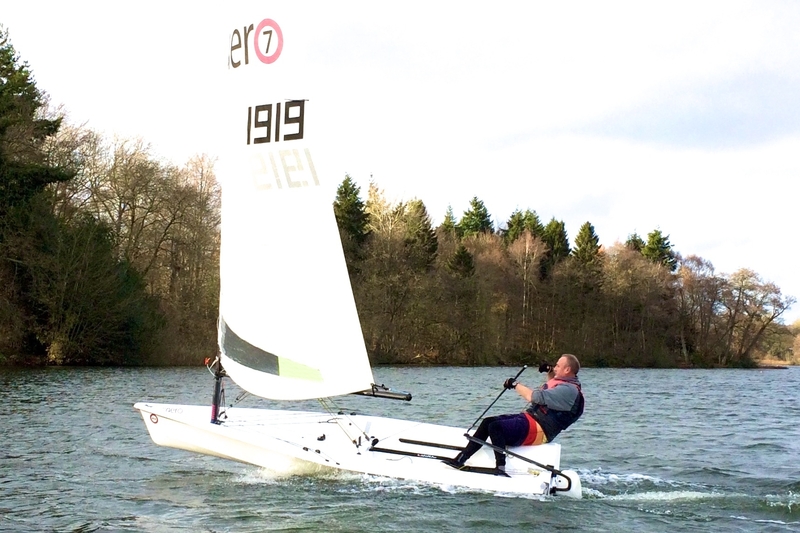 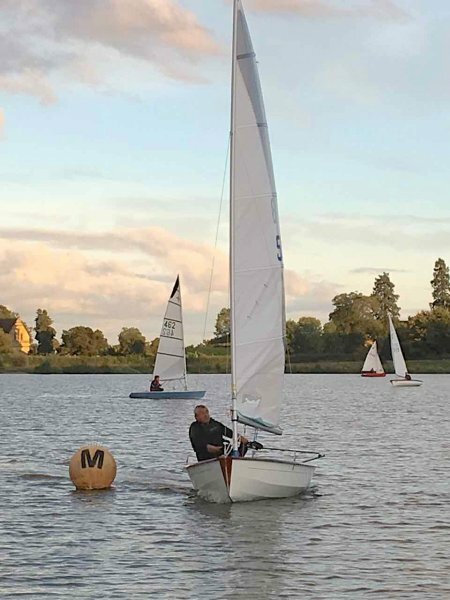 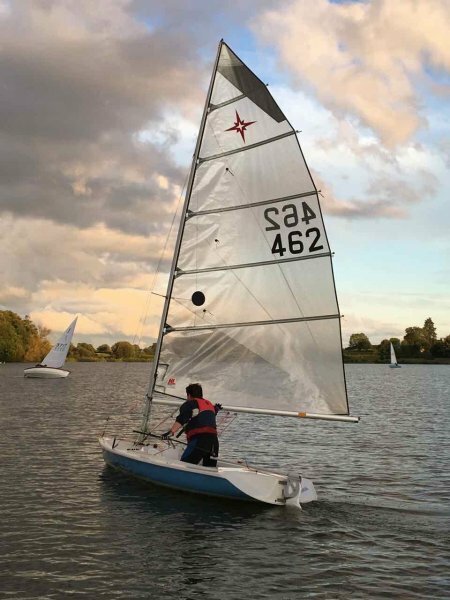 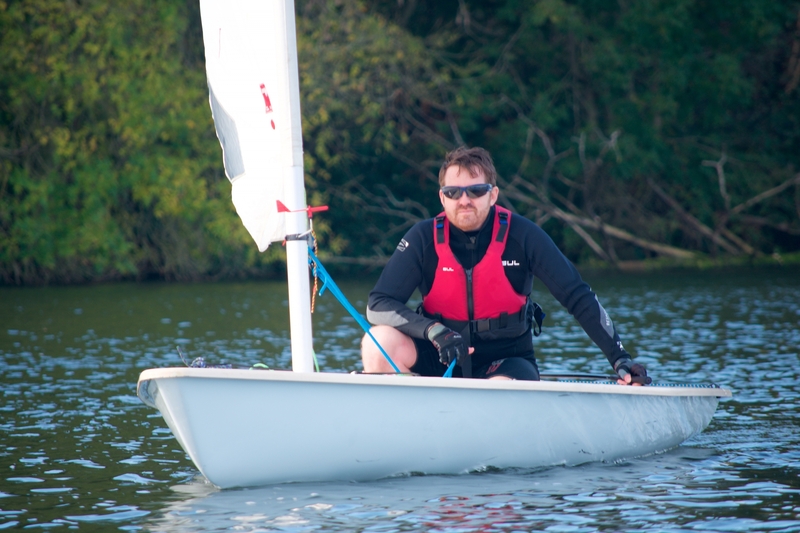 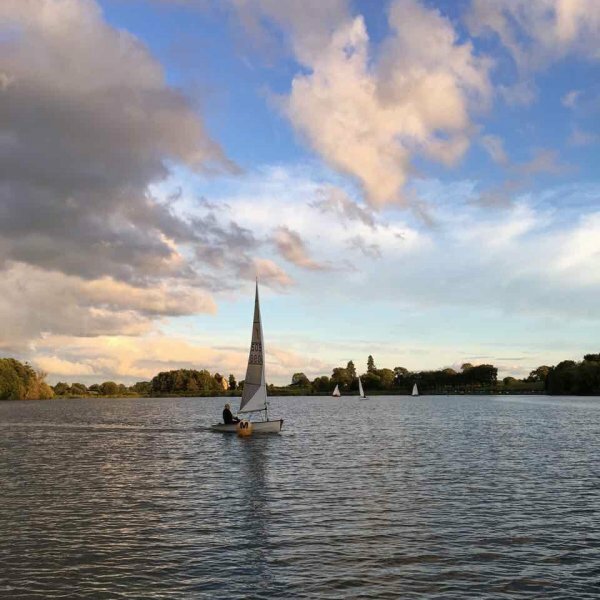 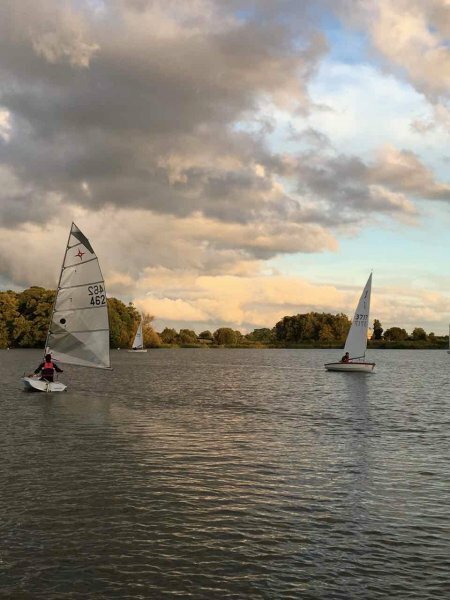 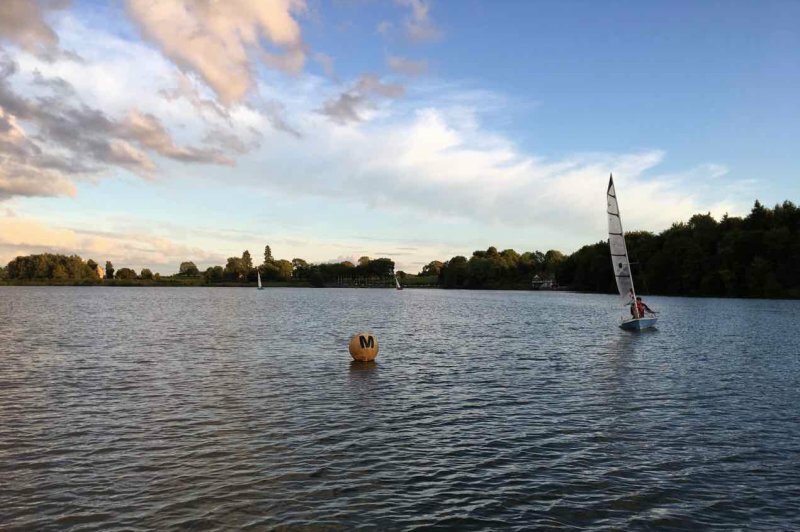 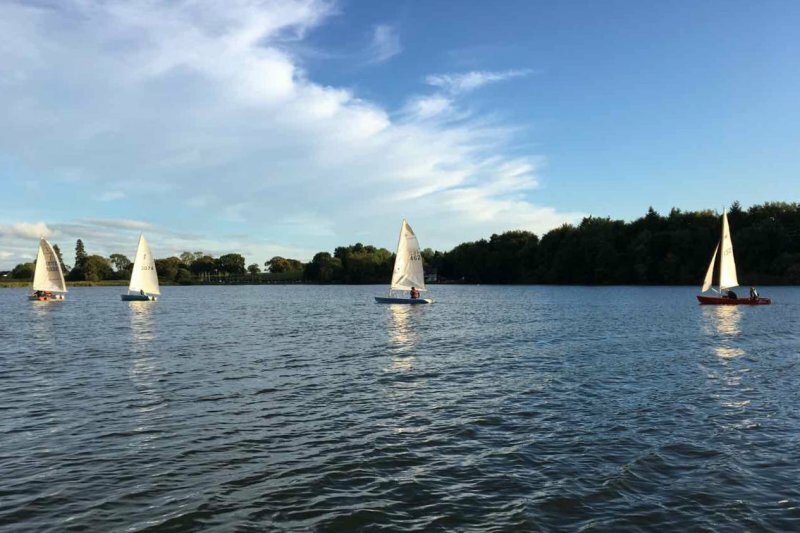 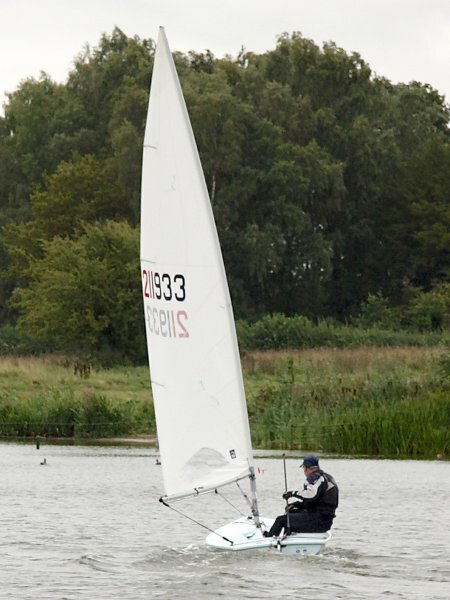 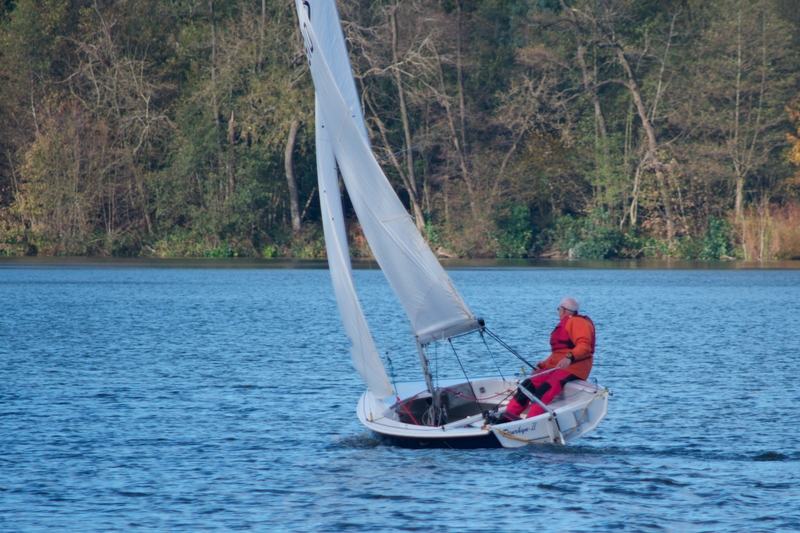 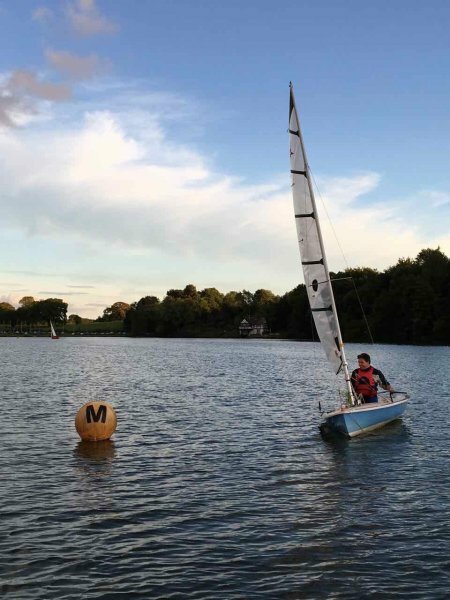 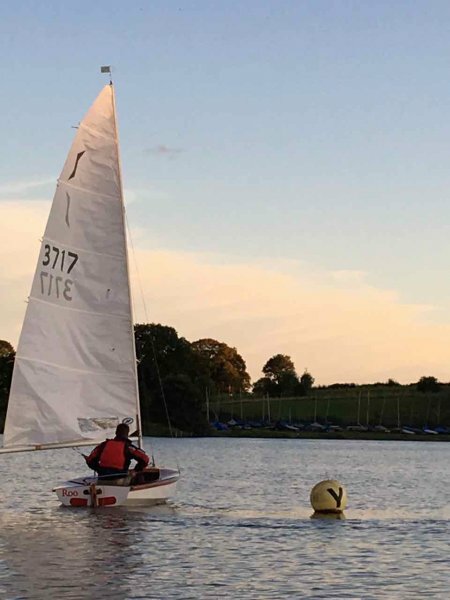 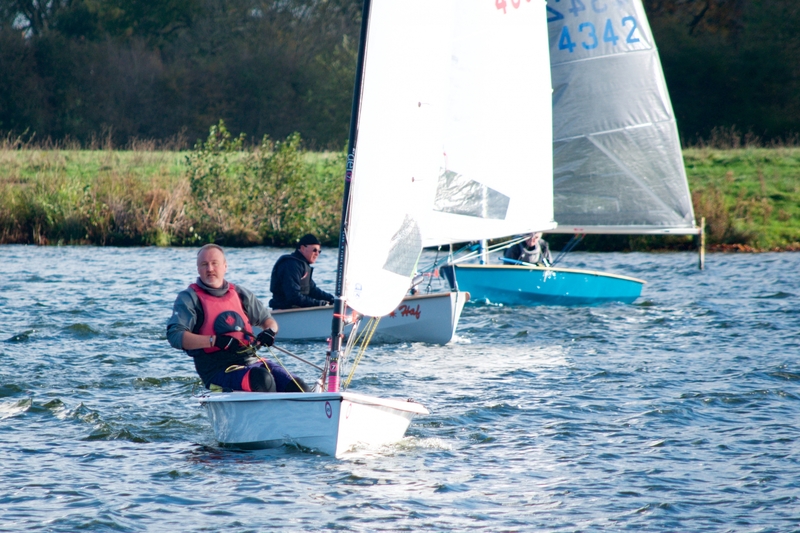 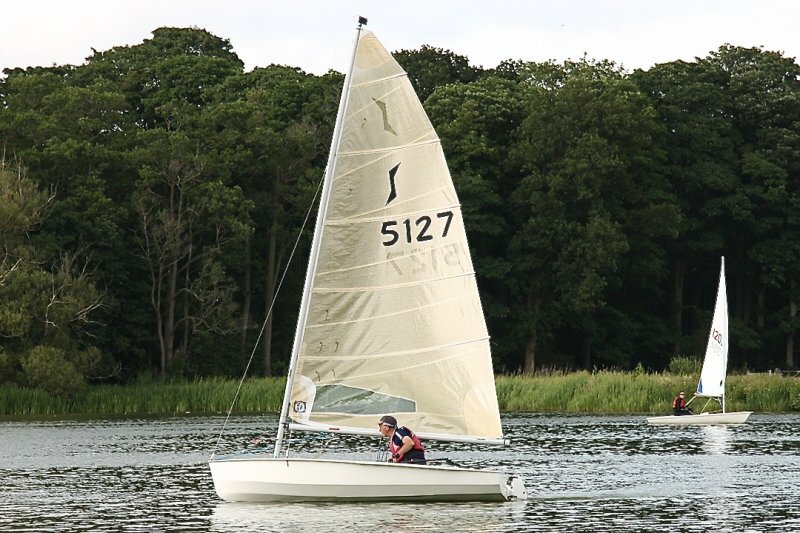 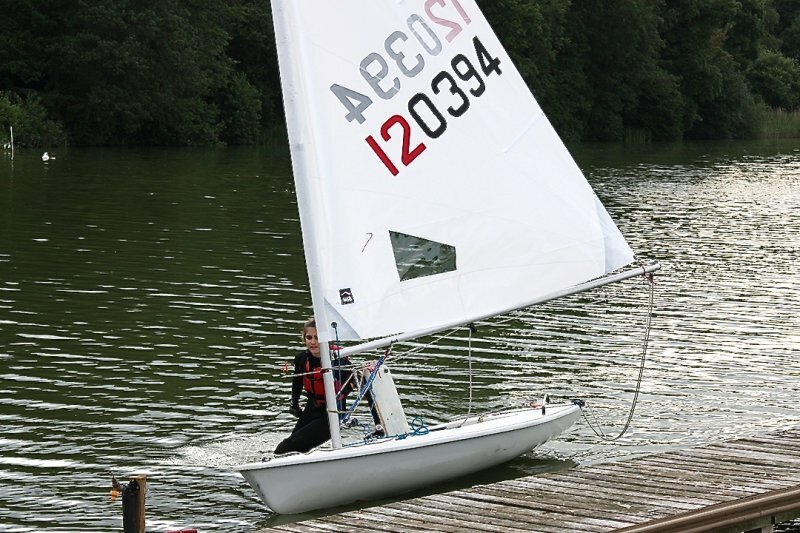 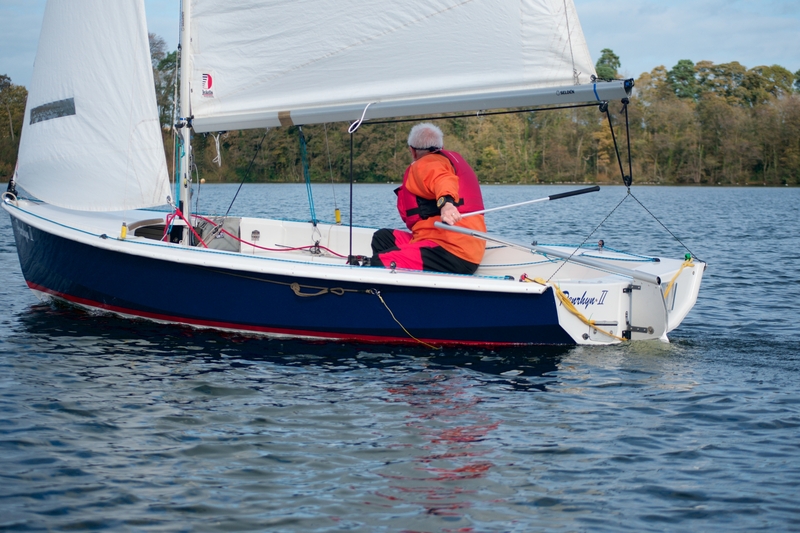 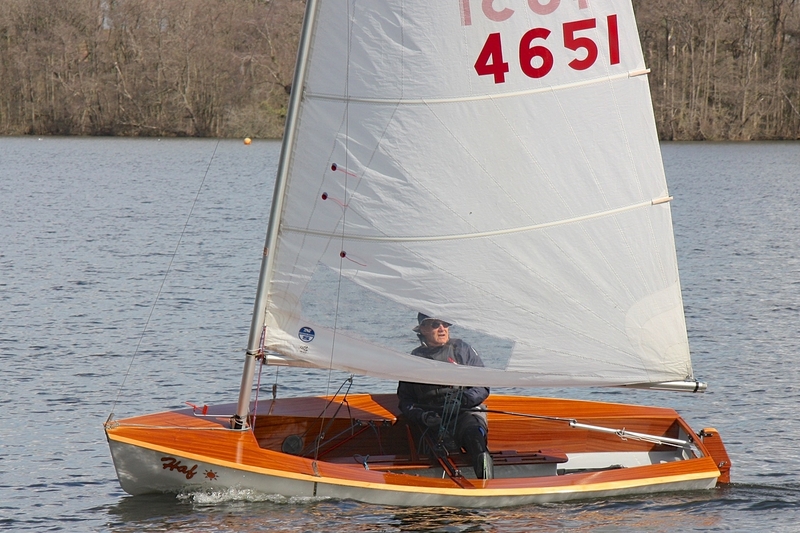 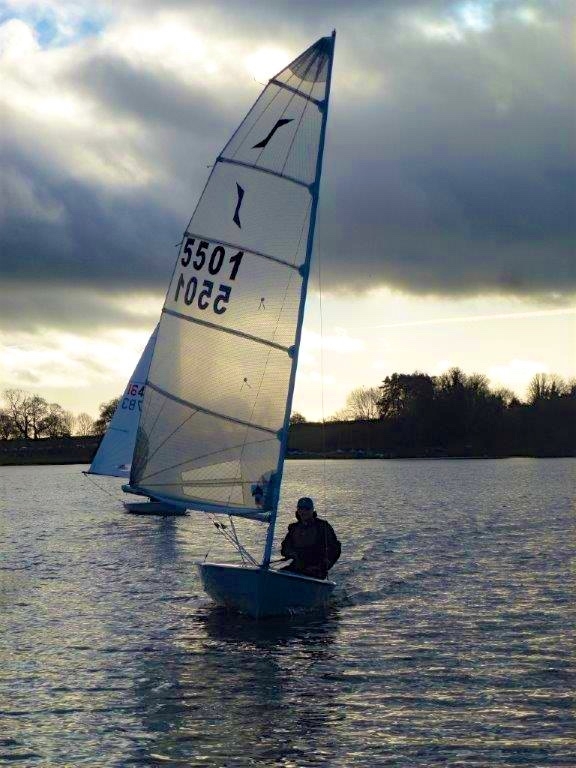 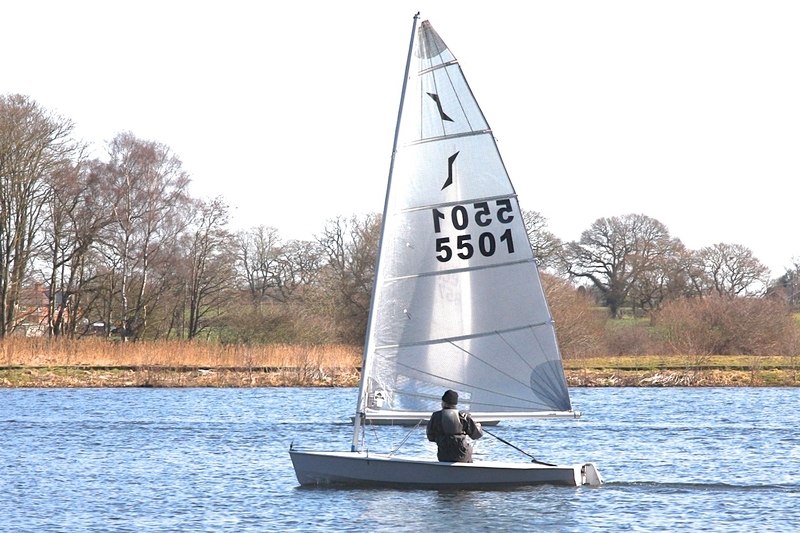 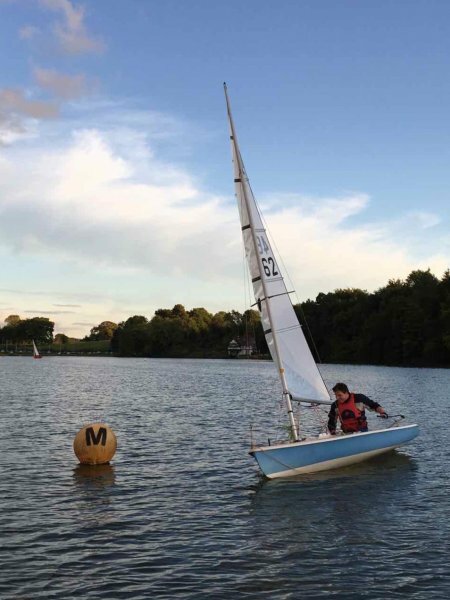 At the end, there was inevitably a winner and this year it was Nick Blore in his new boat, who won not only on the water, but even more so on handicap! 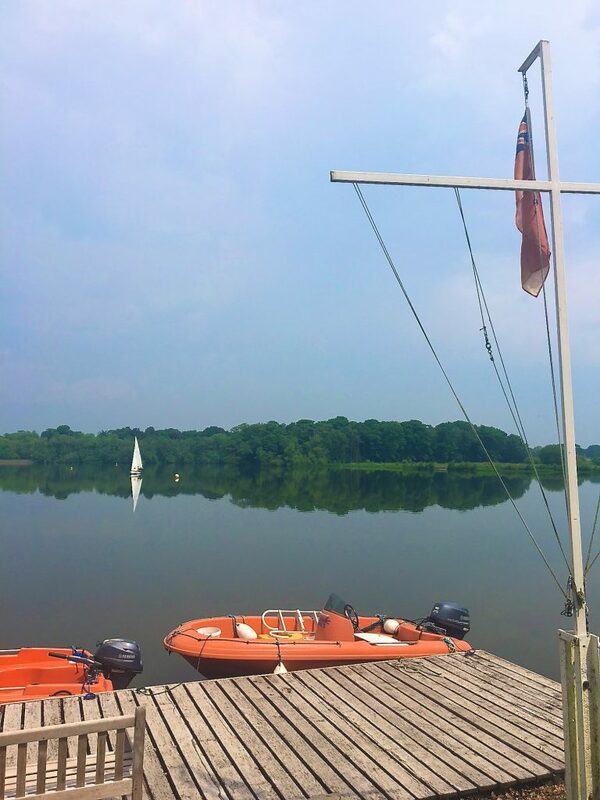 Some pictures taken by myself whilst on duty on Sunday. 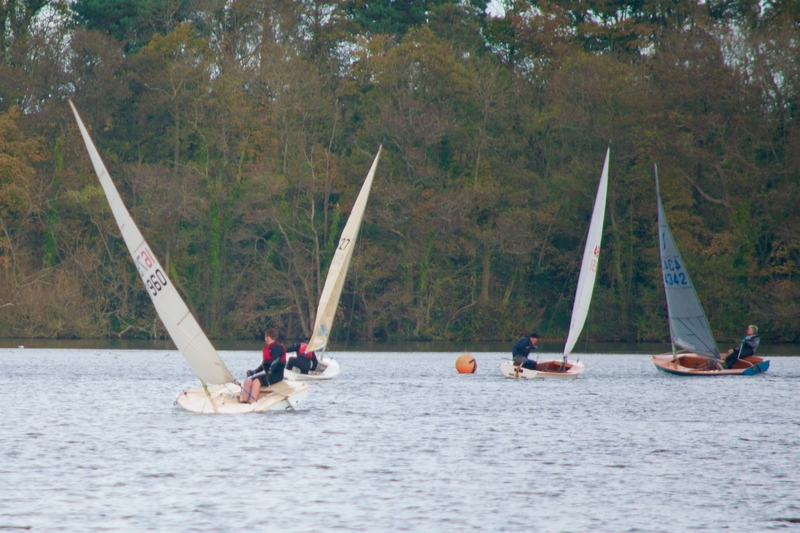 Eleven boats on the water, which is good for the end of October. 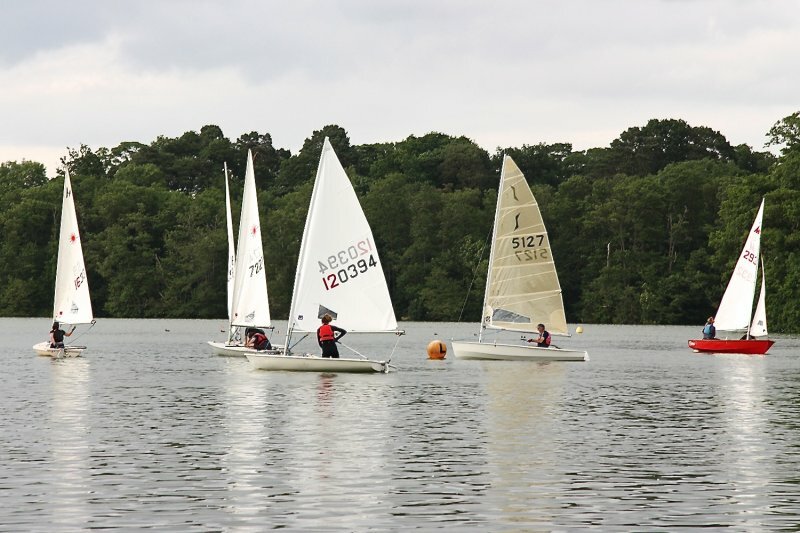 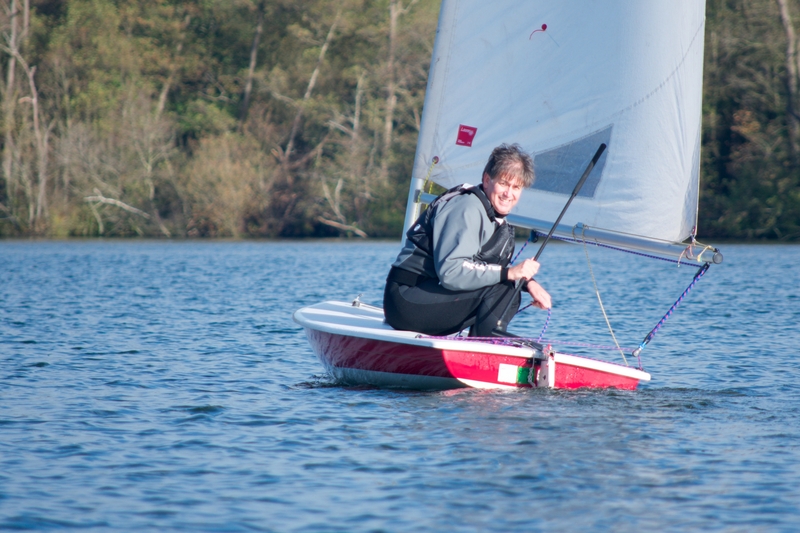 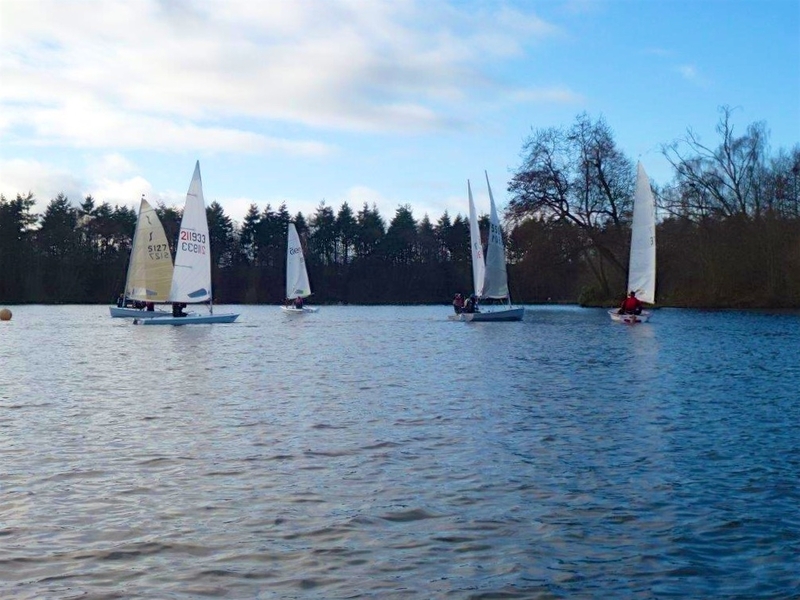 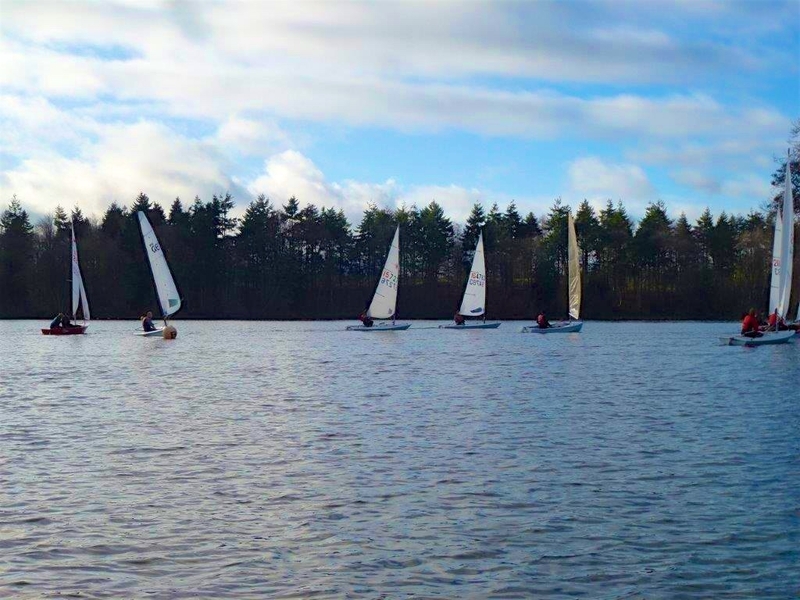 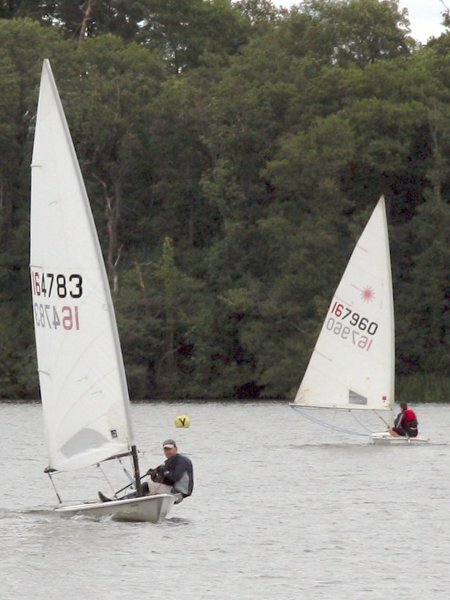 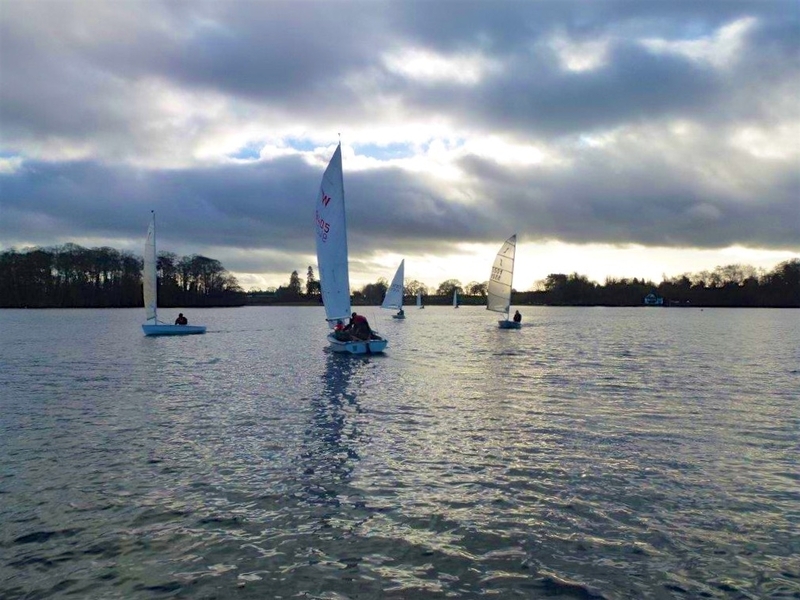 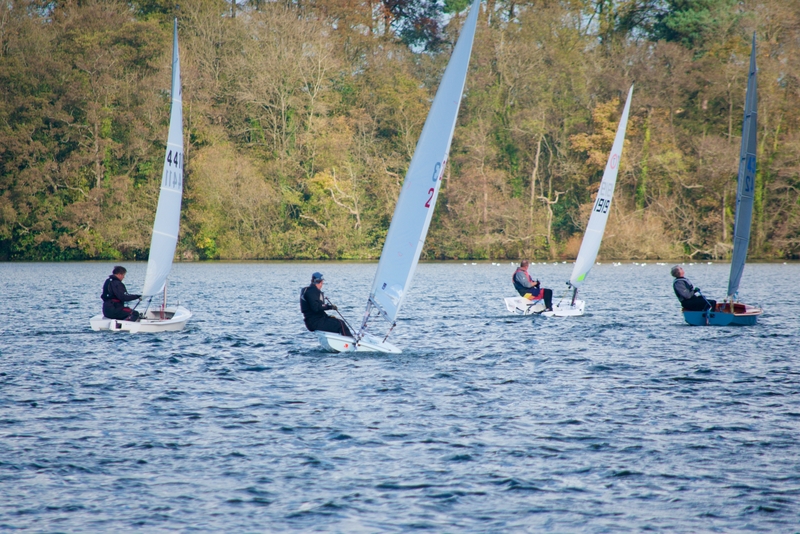 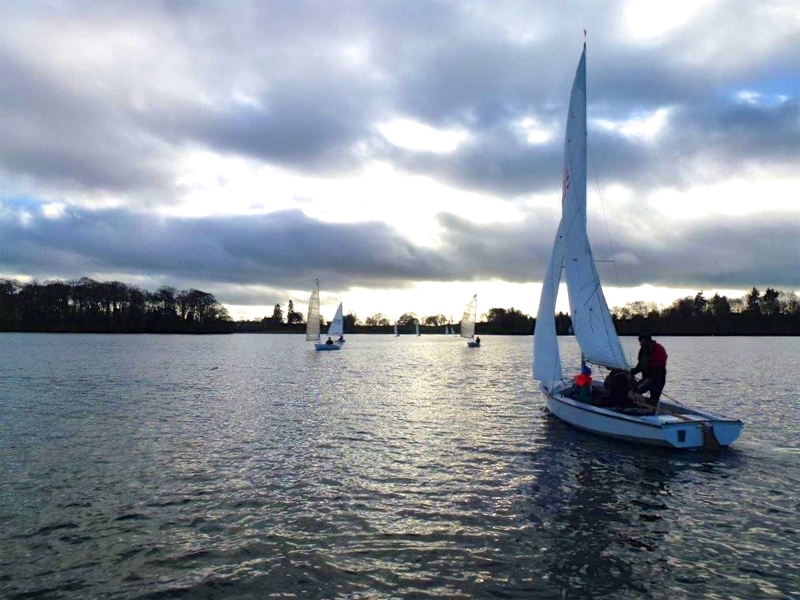 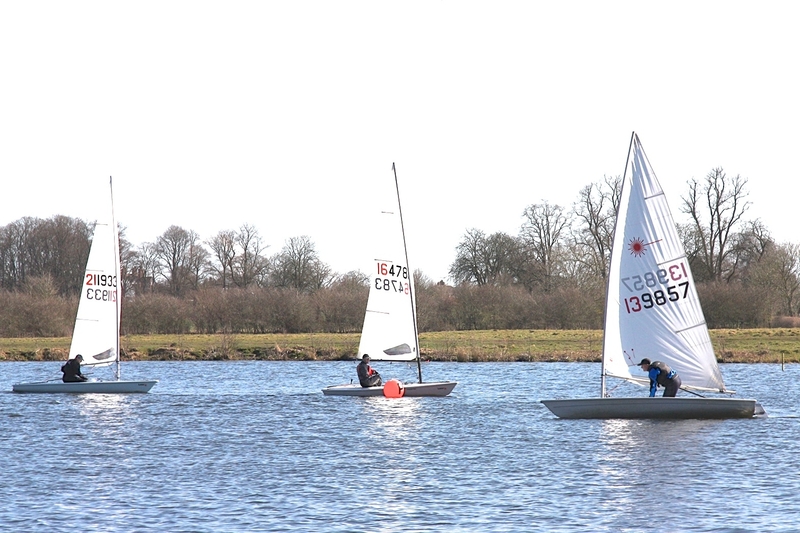 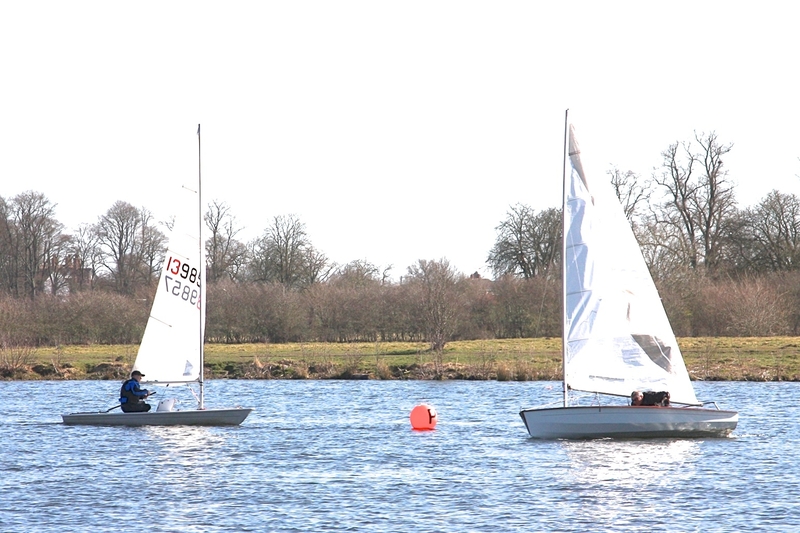 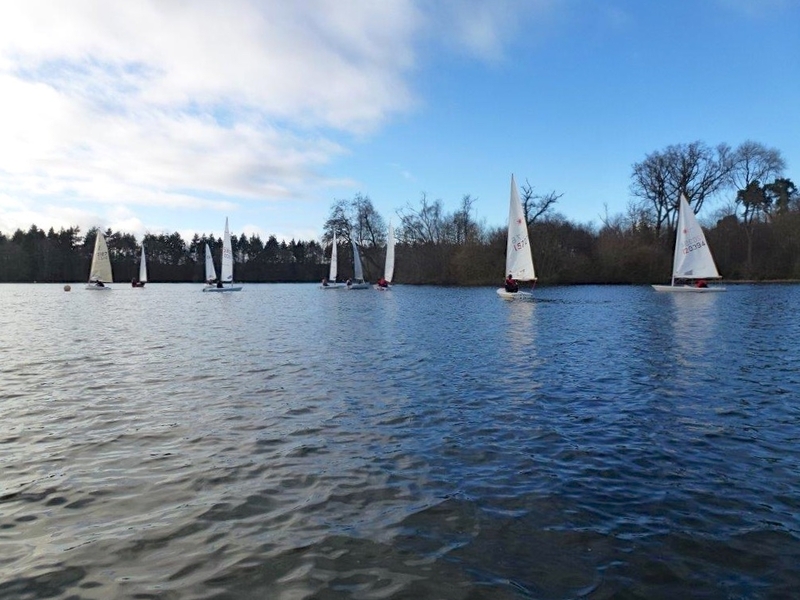 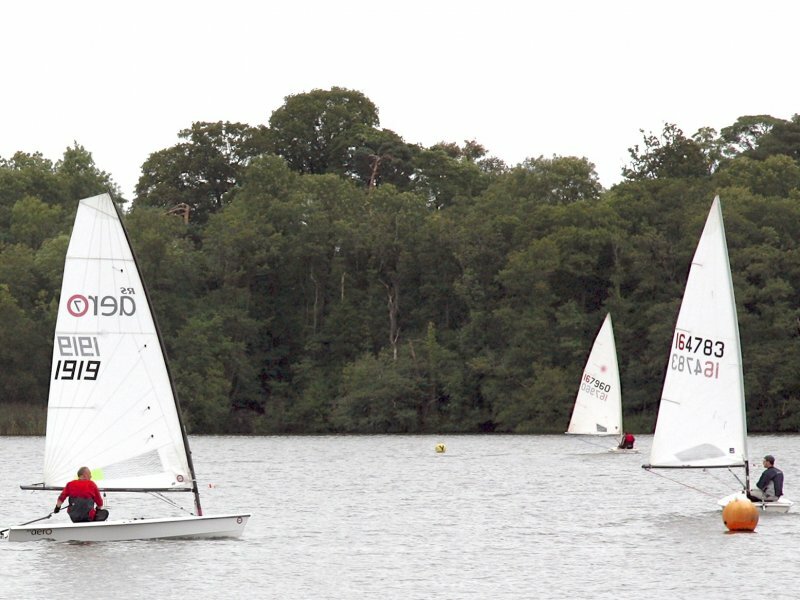 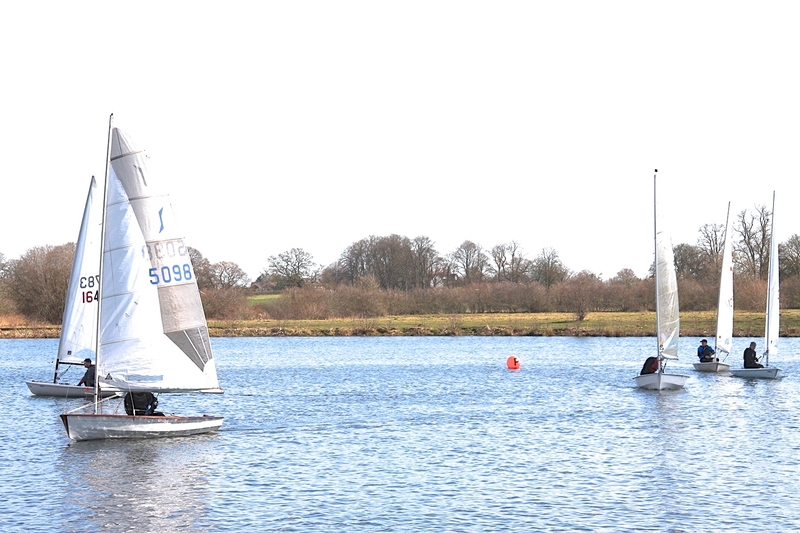 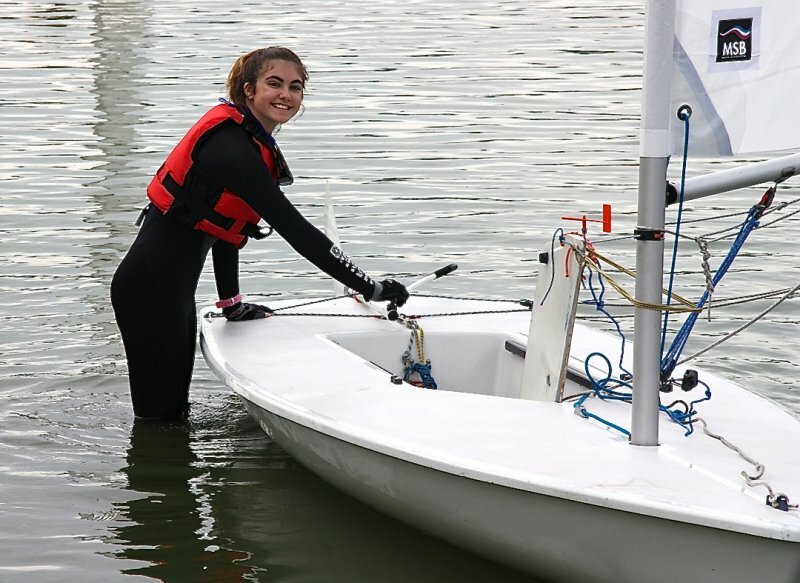 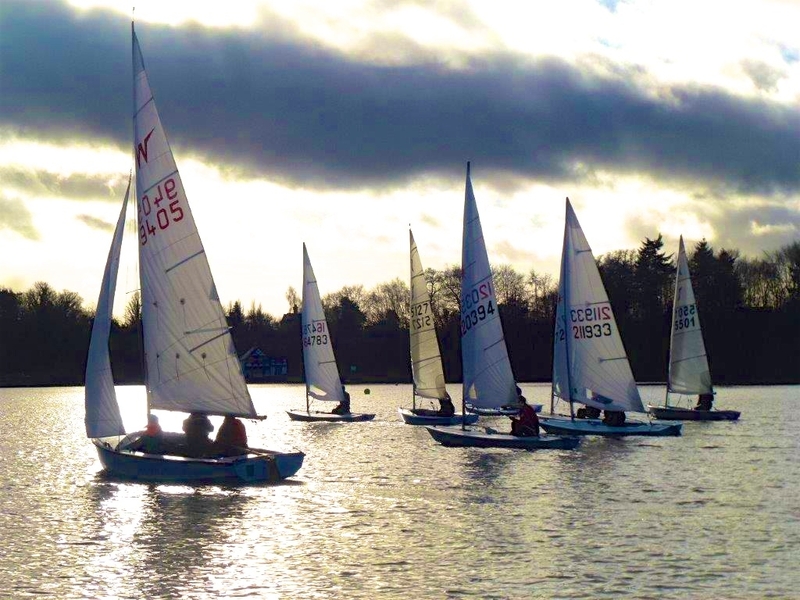 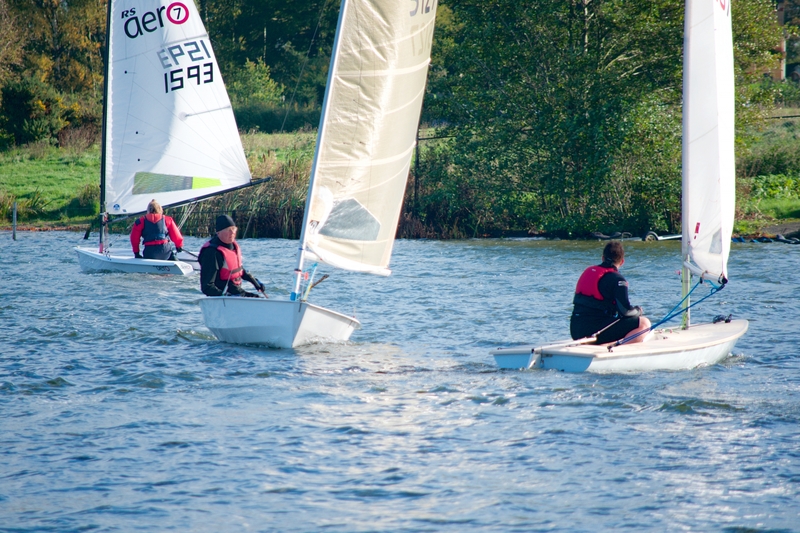 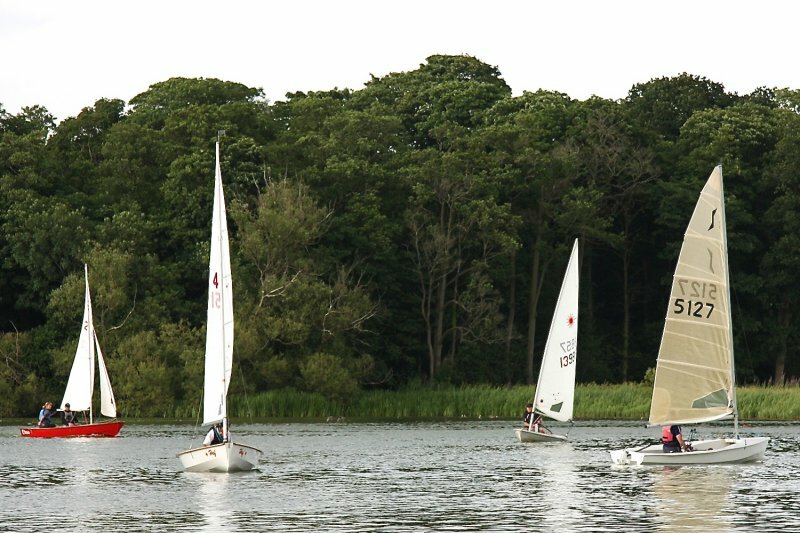 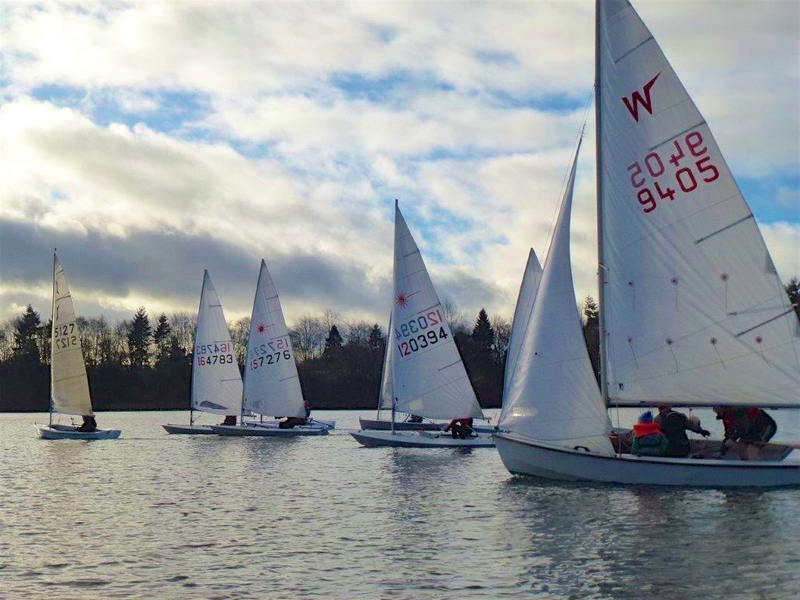 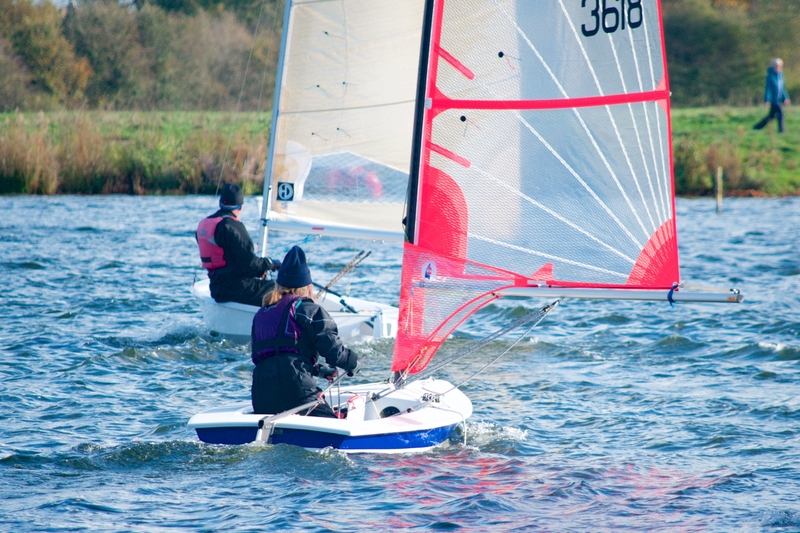 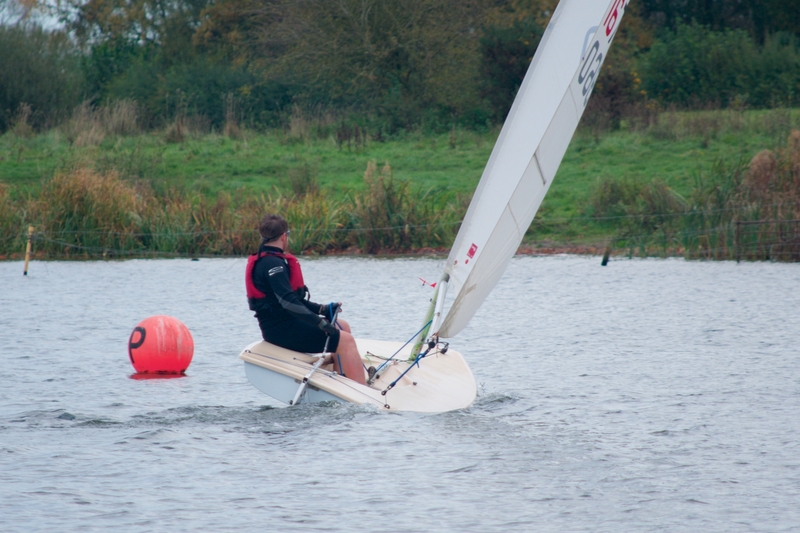 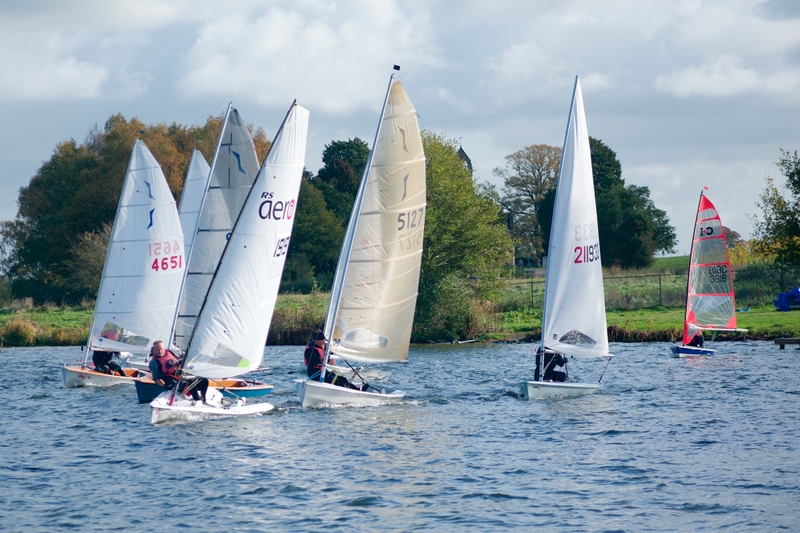 Conditions weren’t too bad, especially at the start of the first race and for the second race. 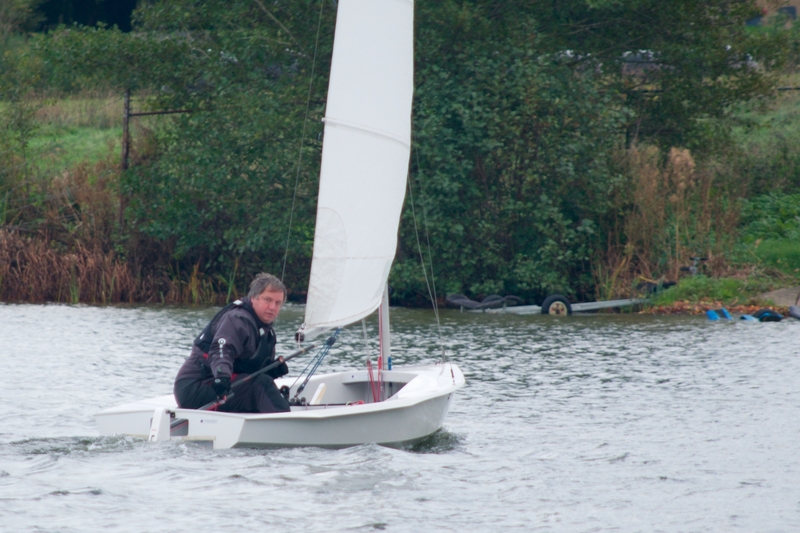 Fellow OOD’s Pete and Rowan kept an eye on the races as I snapped away with my camera. 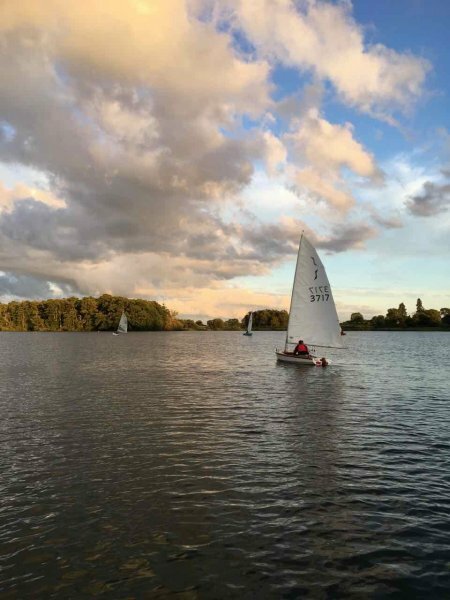 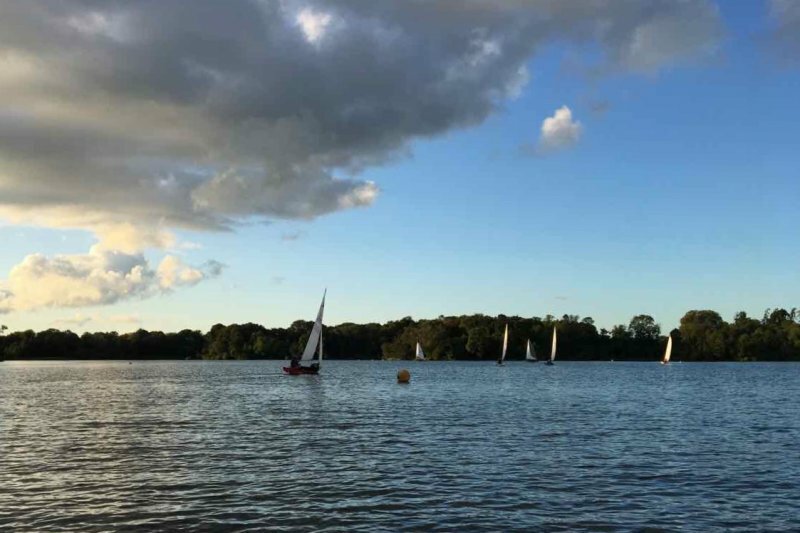 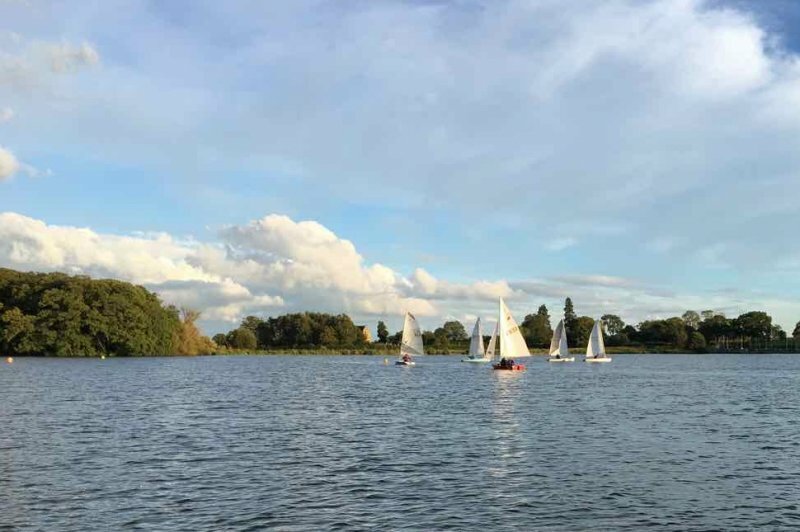 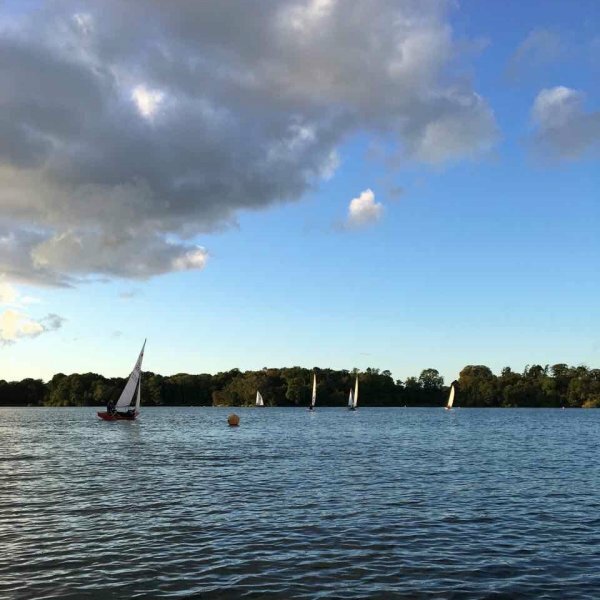 Some pictures from the last Thursday evening race of 2017 (21st September) taken by Duty officer Rob Windsor on his phone. 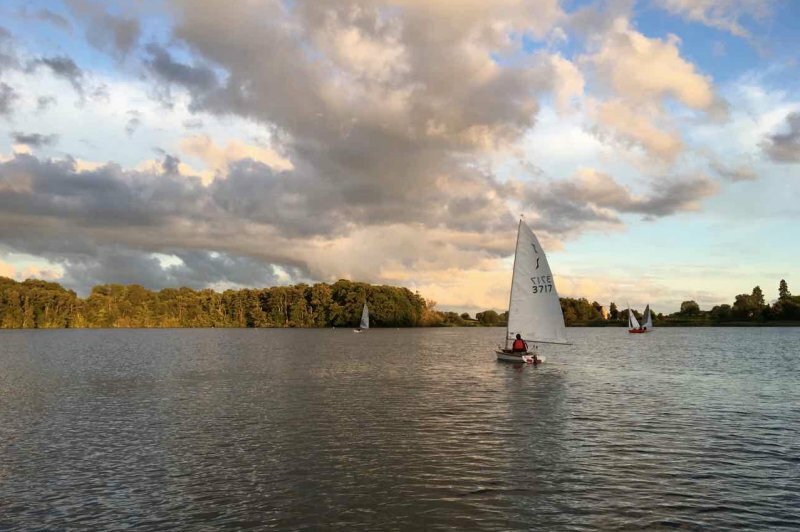 Some great skies over Colemere ! 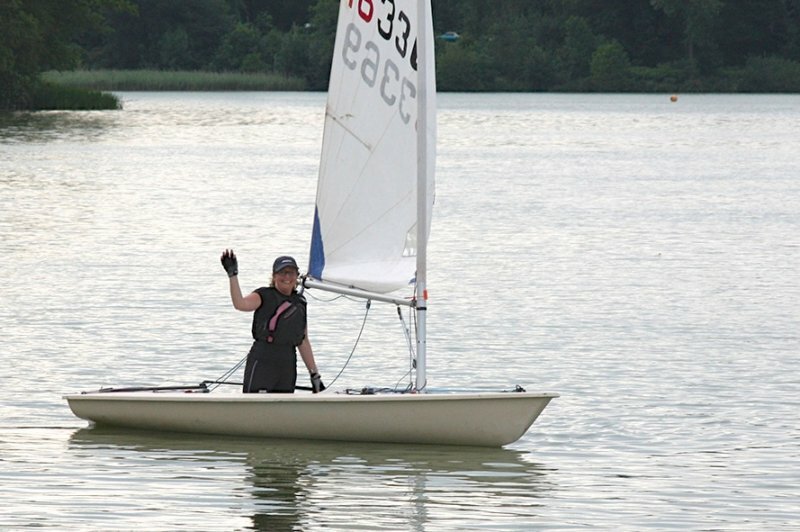 Sorry I couldn’t be there, but had an appointment with a brand new granddaughter in Germany. 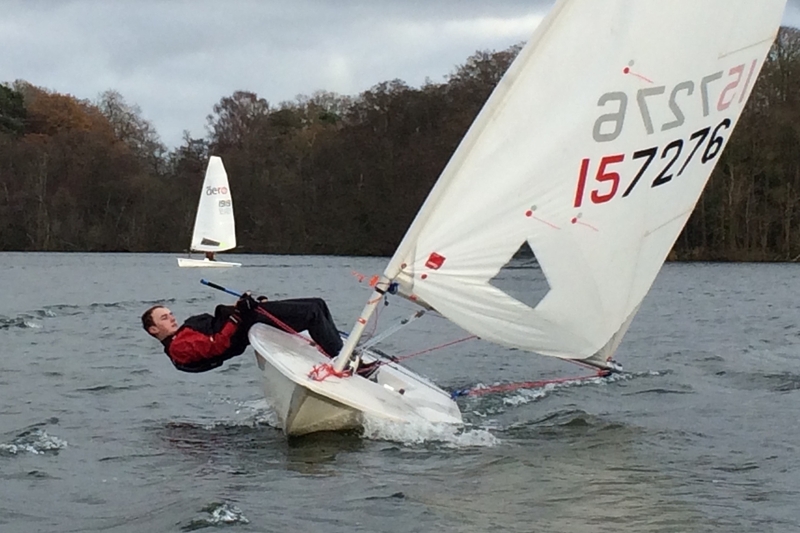 Quite a windy day for sailing, but enjoyable (I thought). 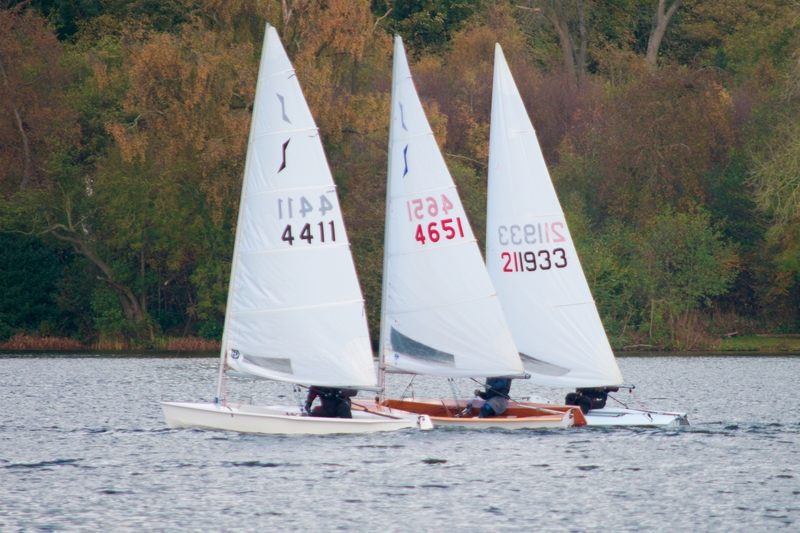 Pictures taken by Graham Edwards of the second race. 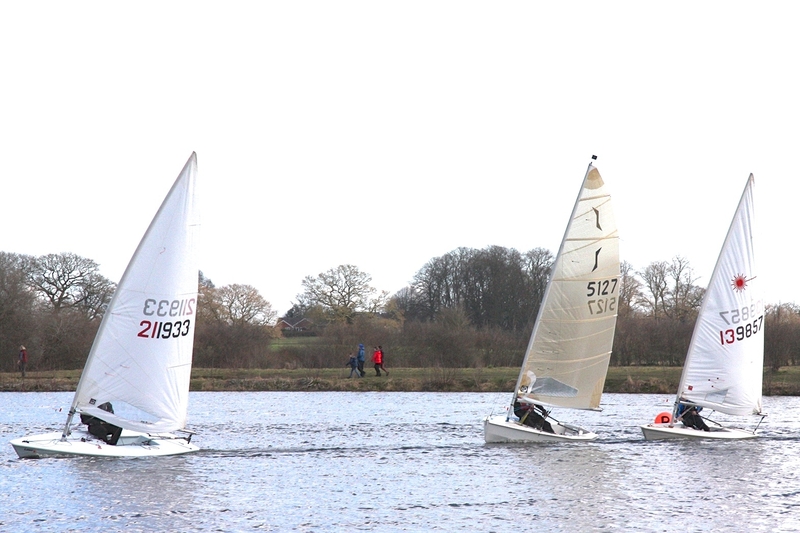 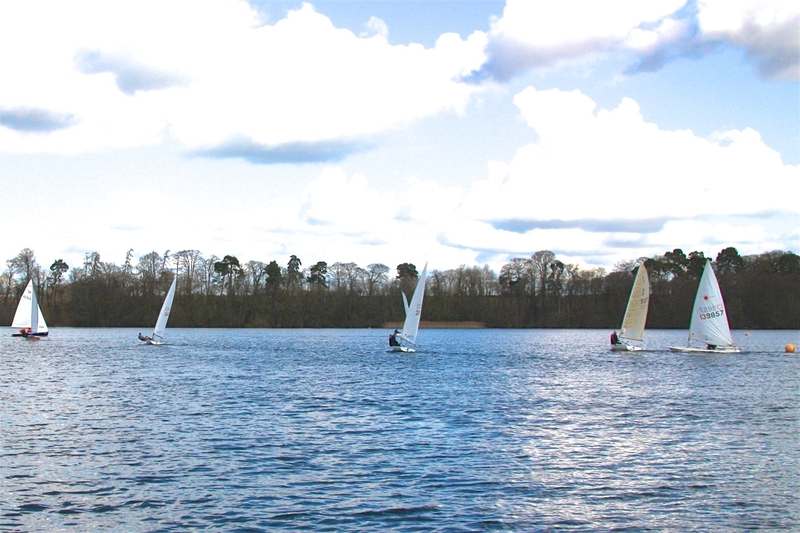 The first race of the day saw 11 boats take to the water but only 5 braved the second. 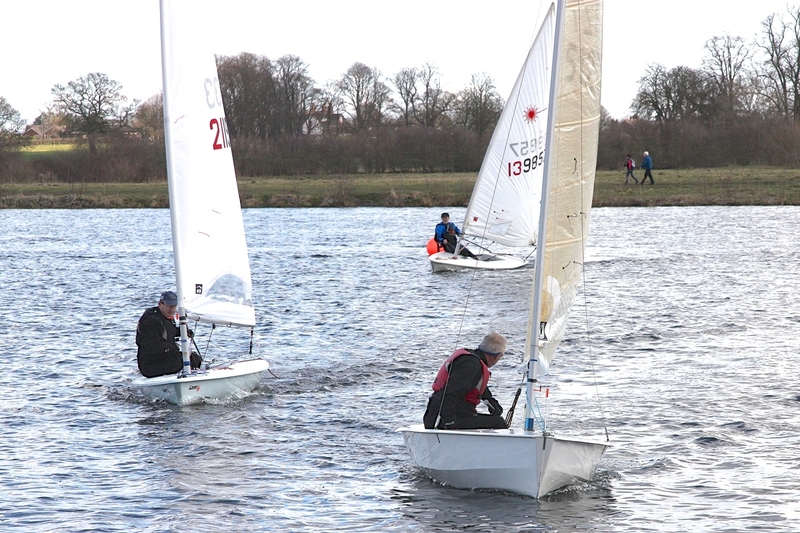 Video footage of Sunday’s first race. 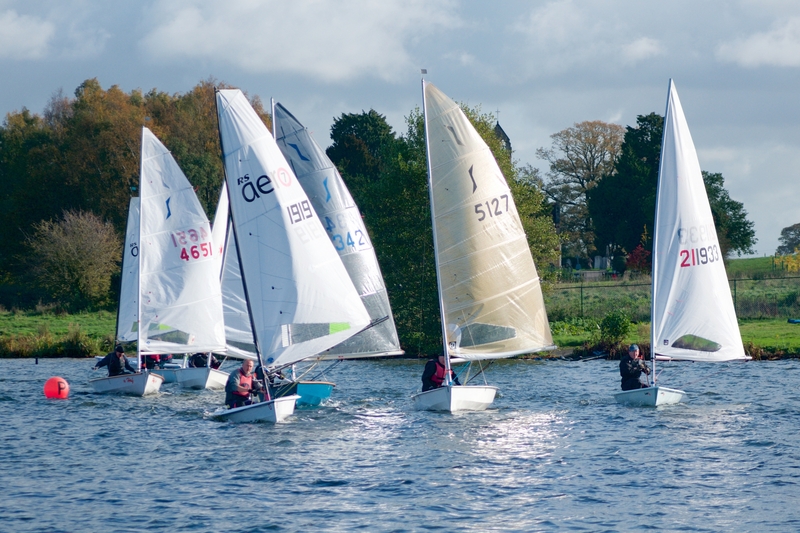 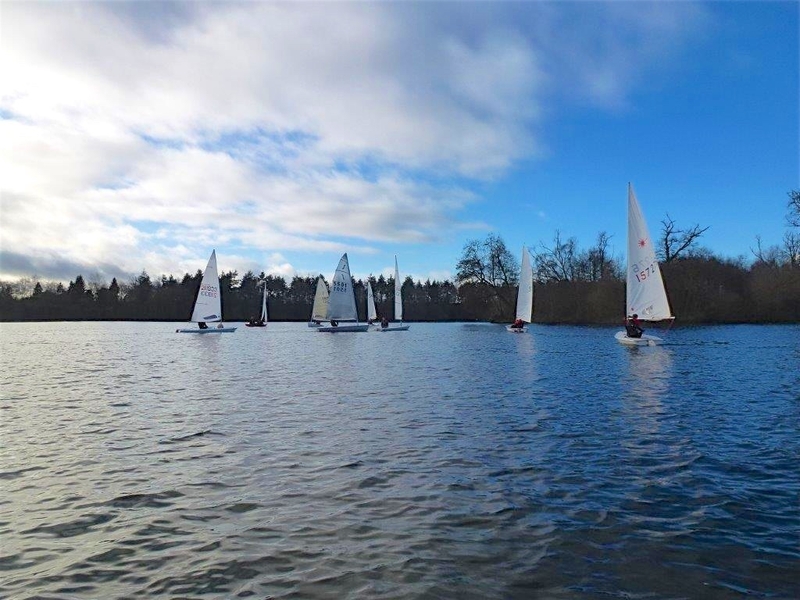 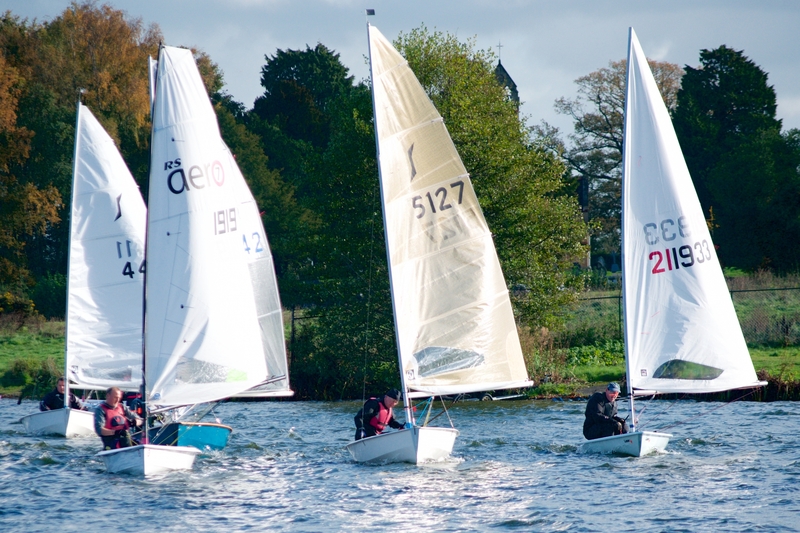 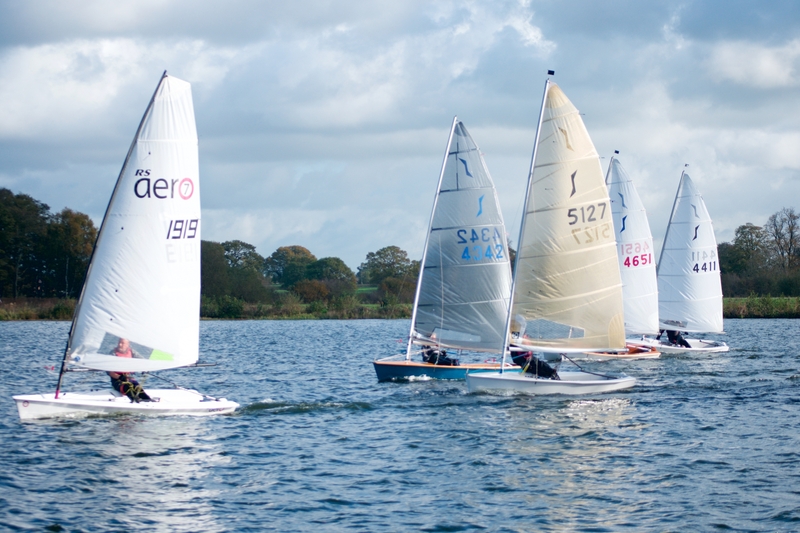 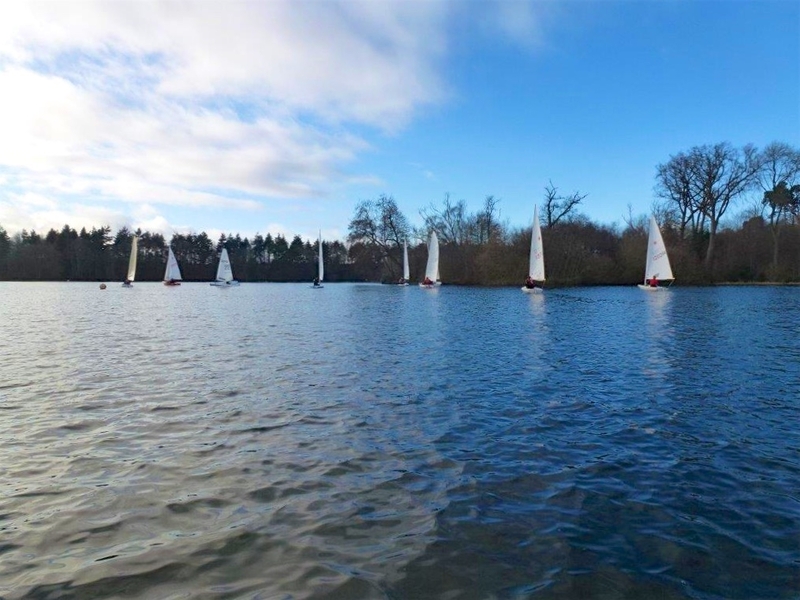 Here’s some video footage showing the start and end of the first race on Sunday taken by Richard Mansfield. 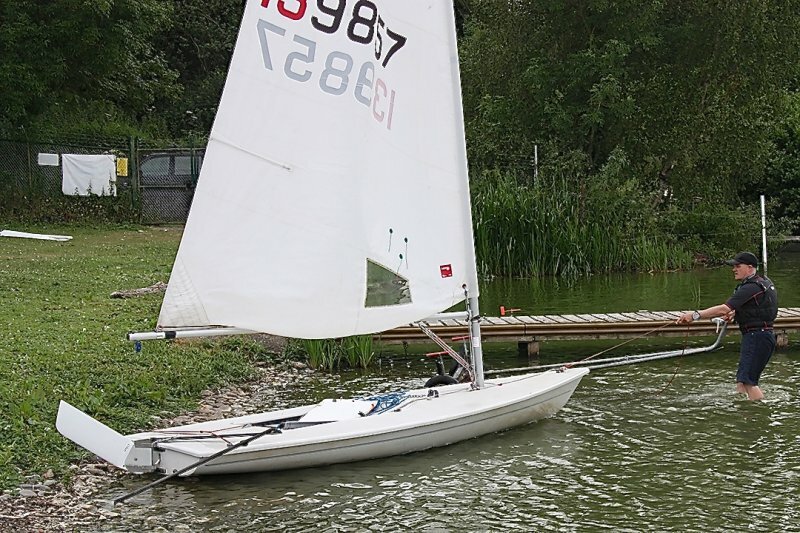 This News Blog part of the website is mainly for Club Members, however, past and potential members may find it interesting. 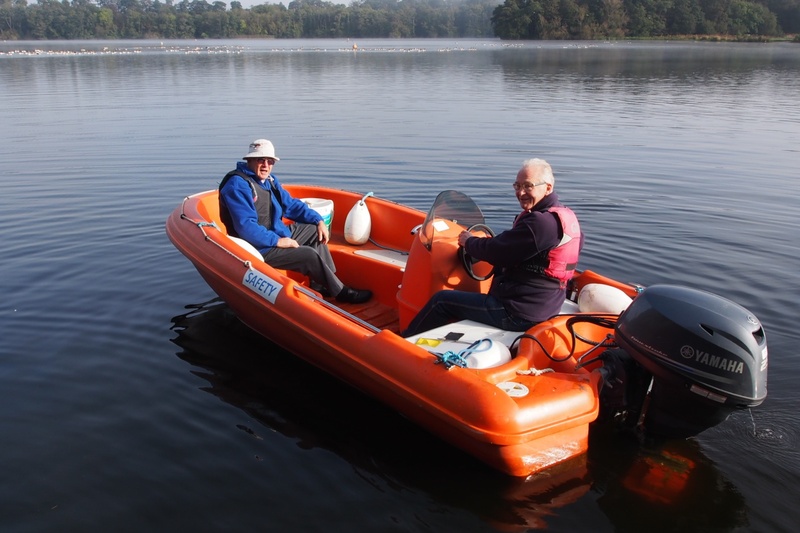 Members can check on the up to date Duty List here.